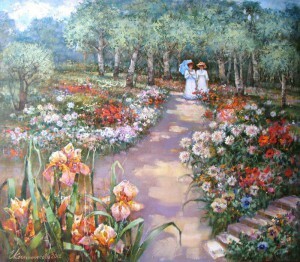 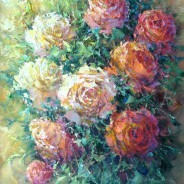 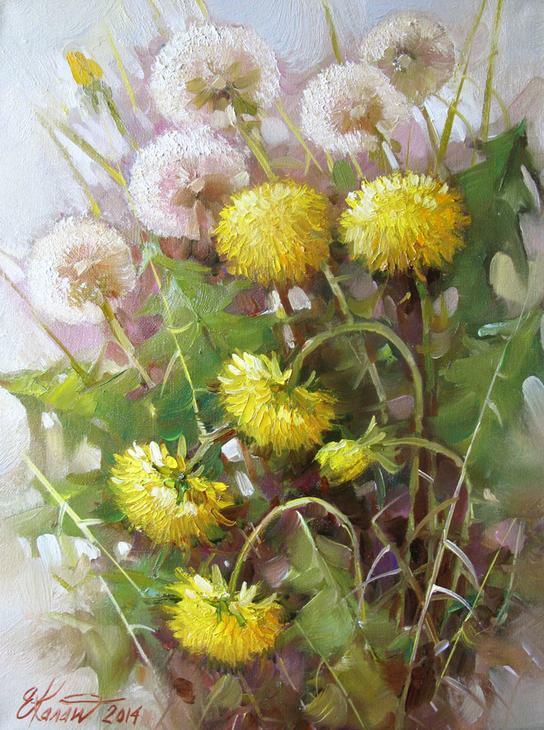 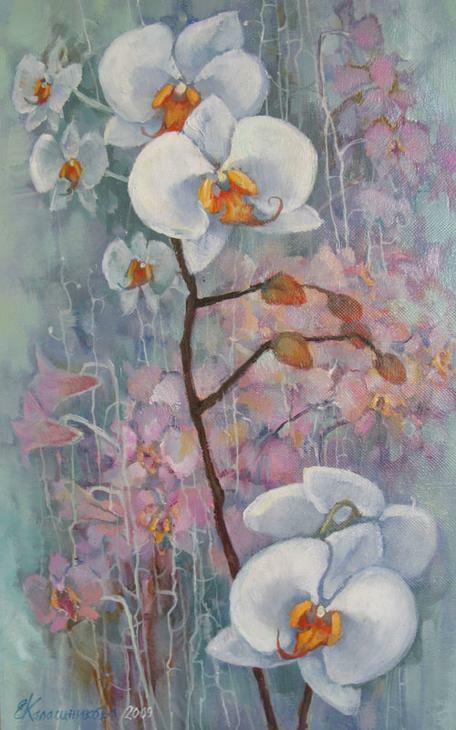 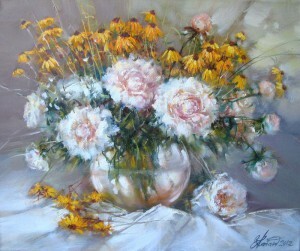 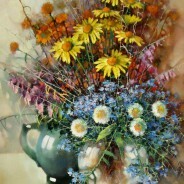 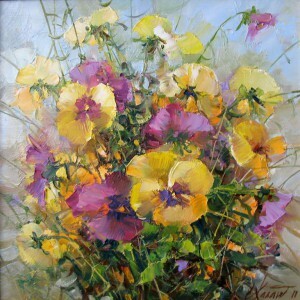 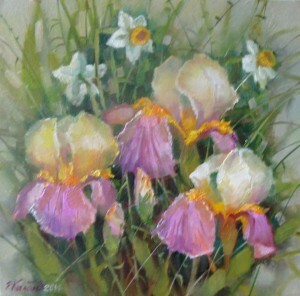 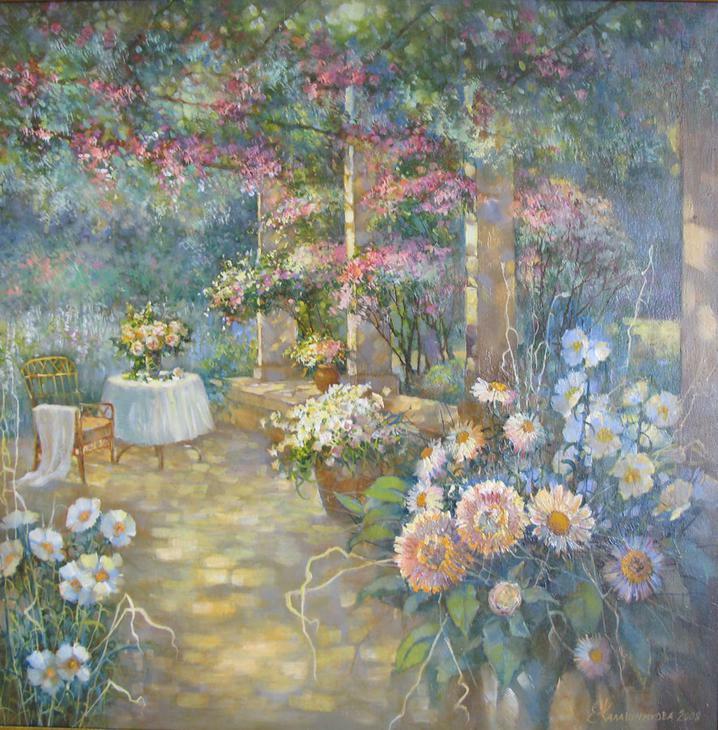 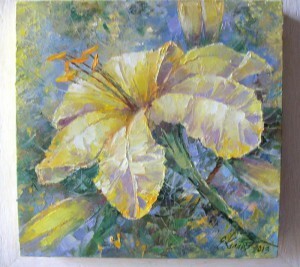 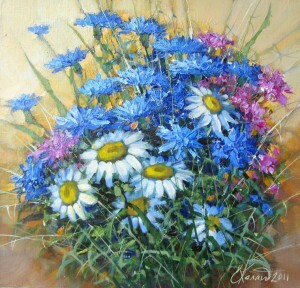 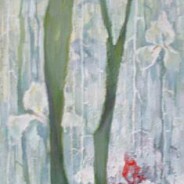 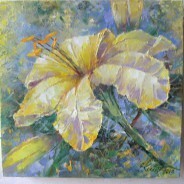 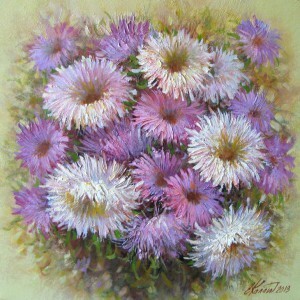 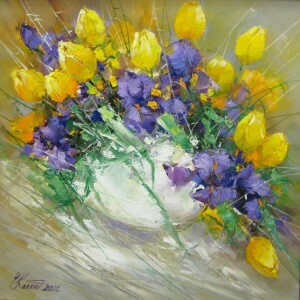 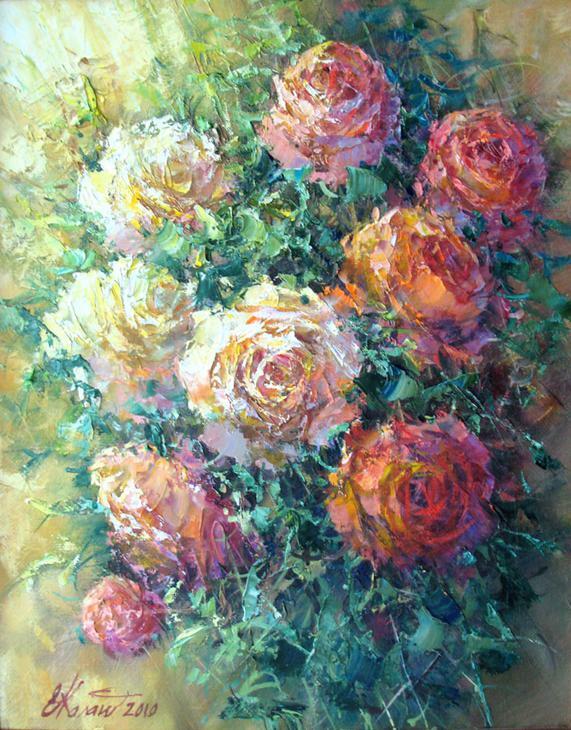 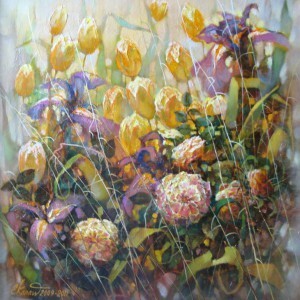 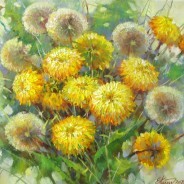 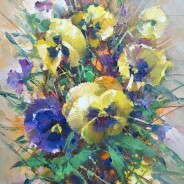 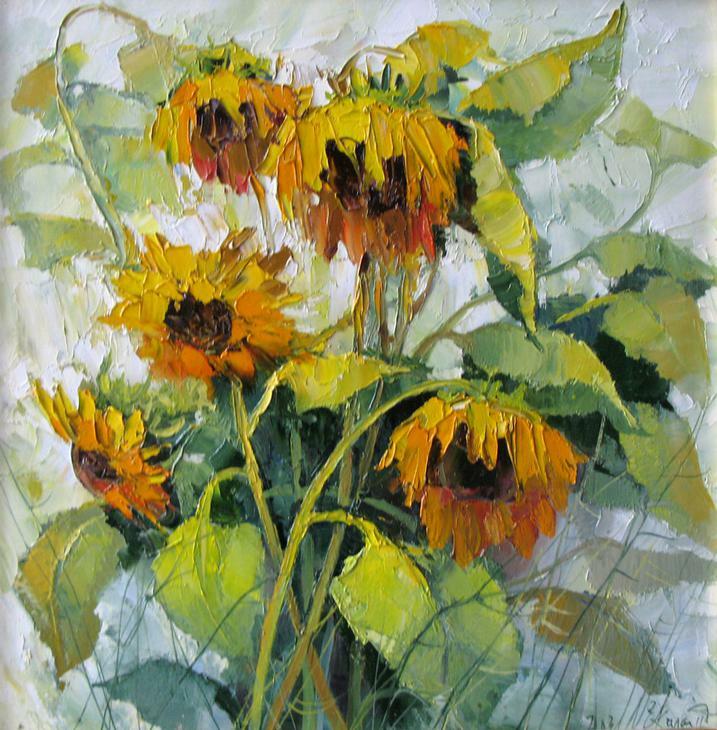 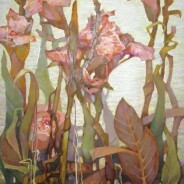 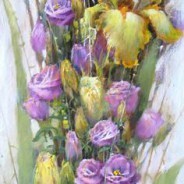 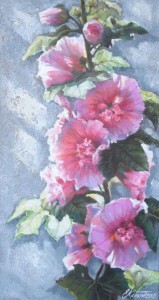 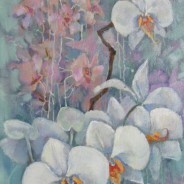 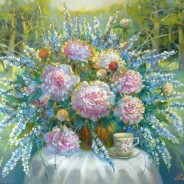 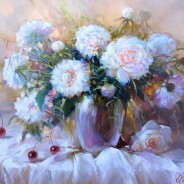 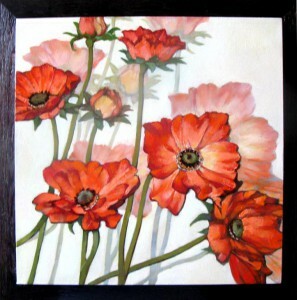 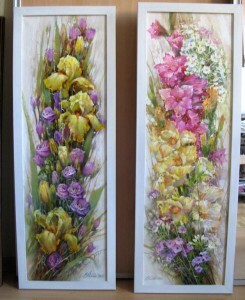 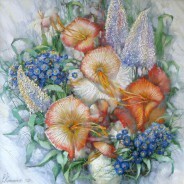 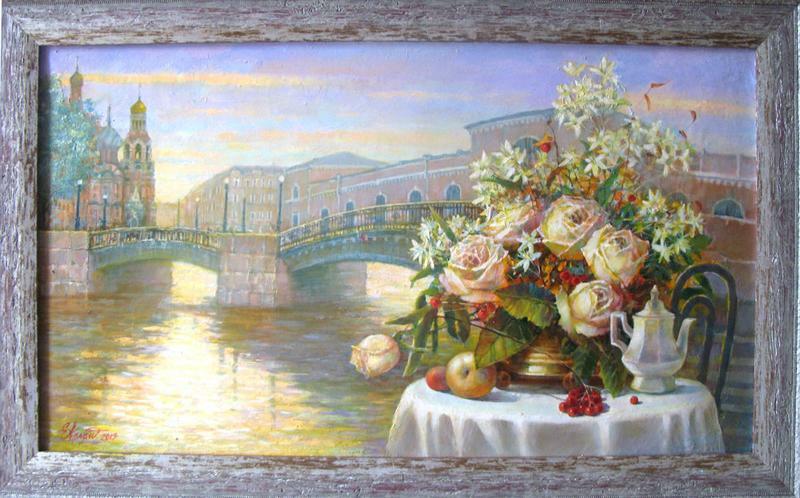 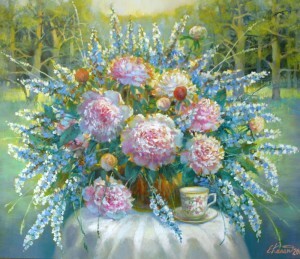 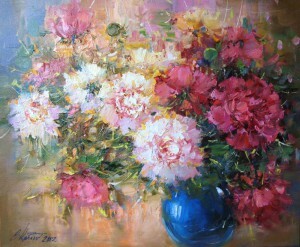 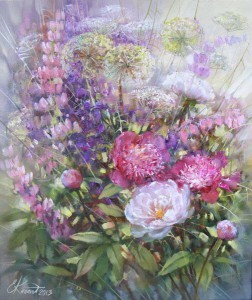 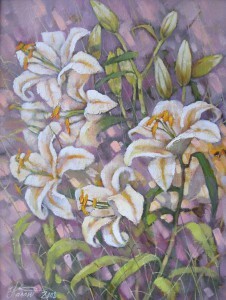 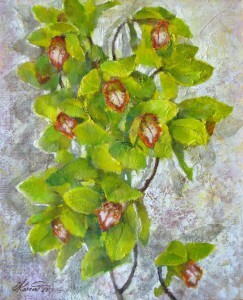 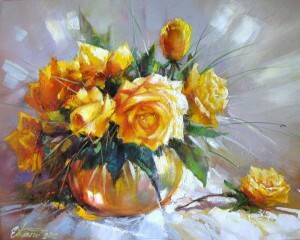 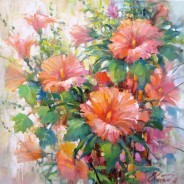 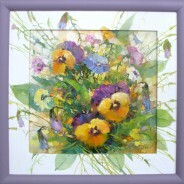 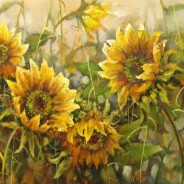 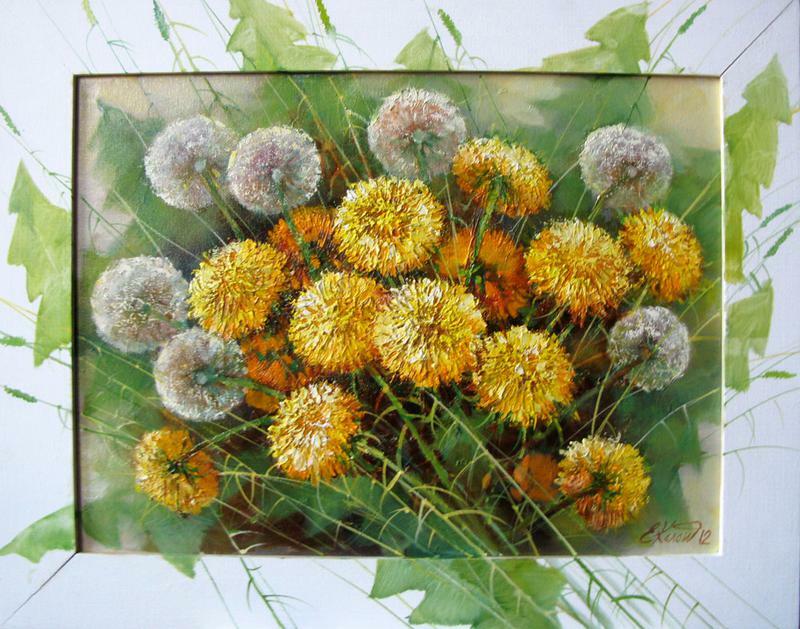 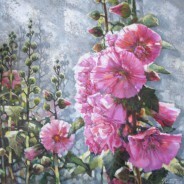 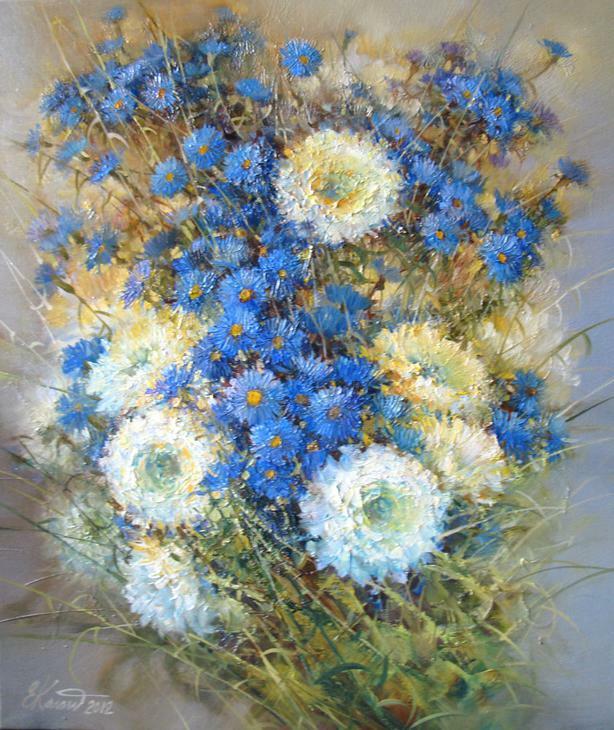 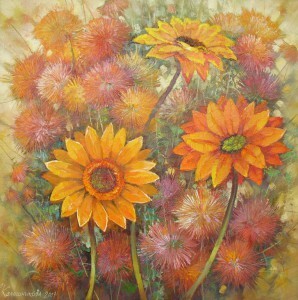 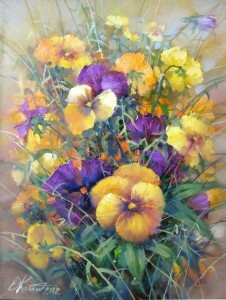 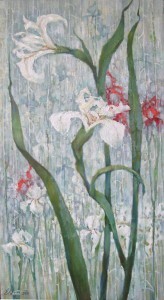 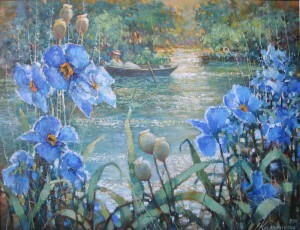 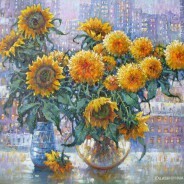 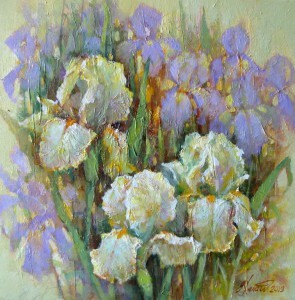 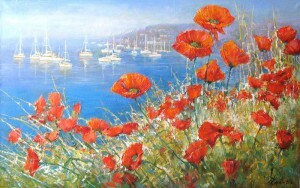 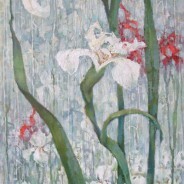 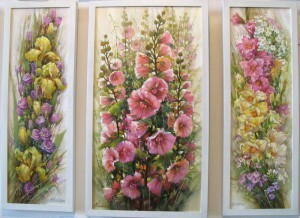 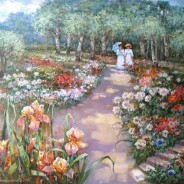 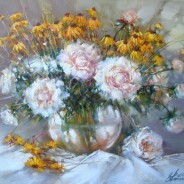 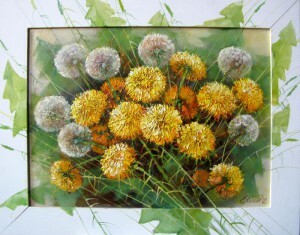 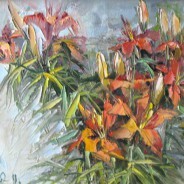 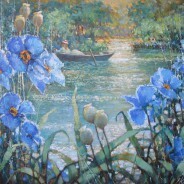 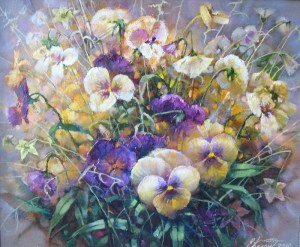 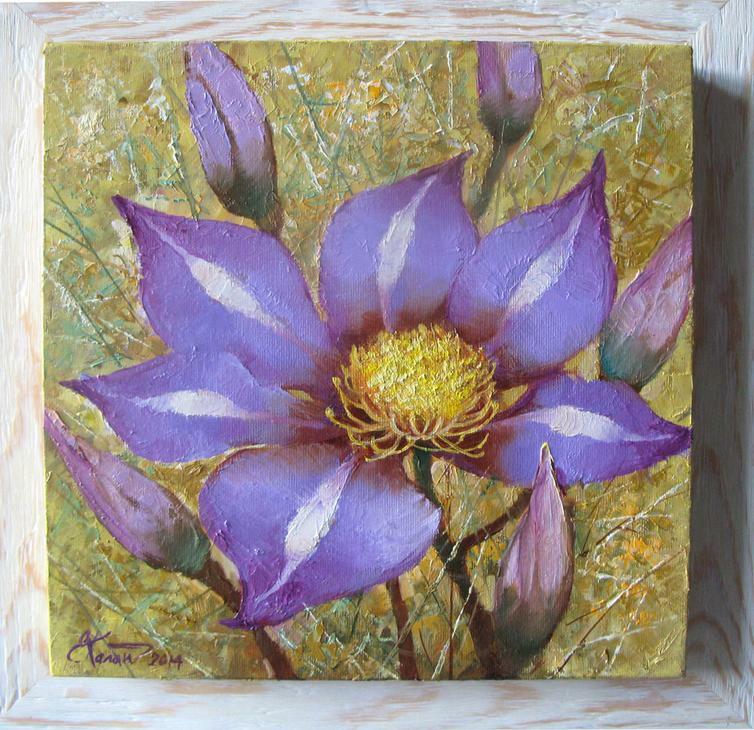 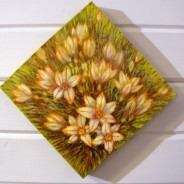 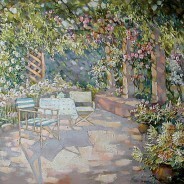 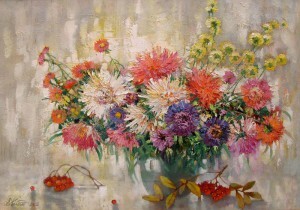 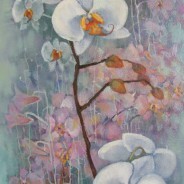 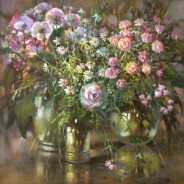 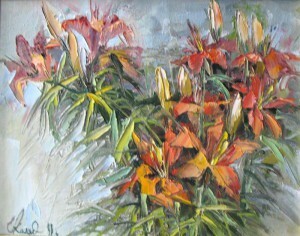 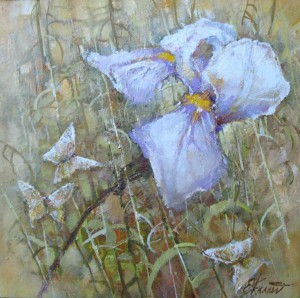 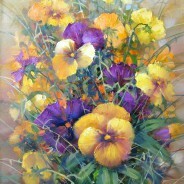 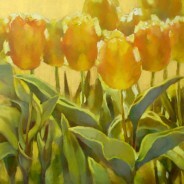 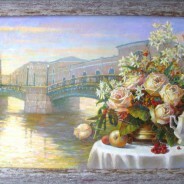 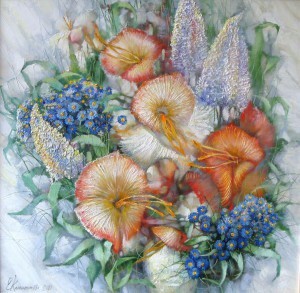 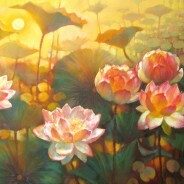 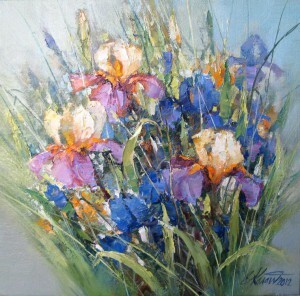 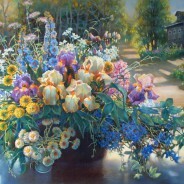 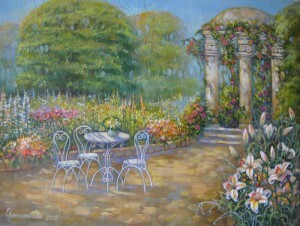 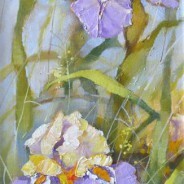 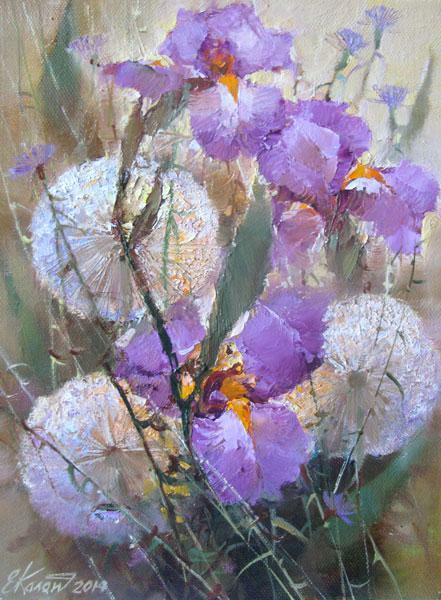 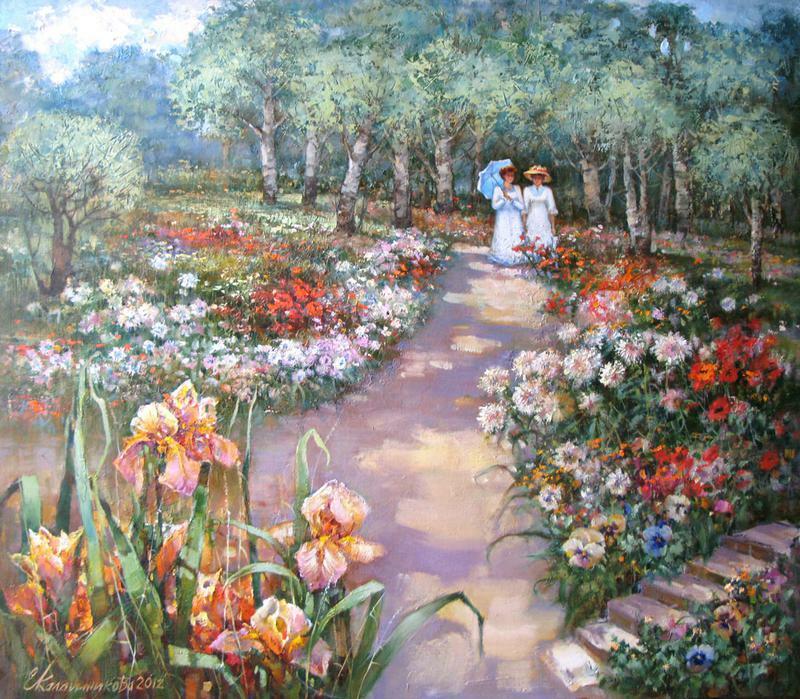 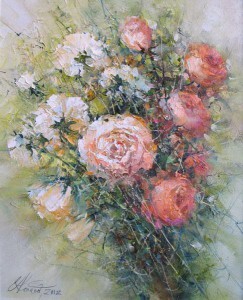 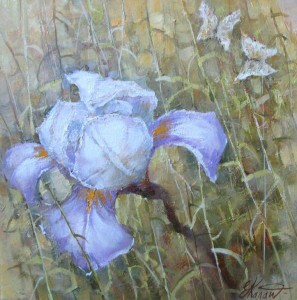 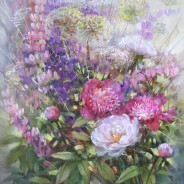 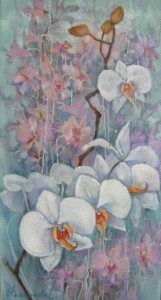 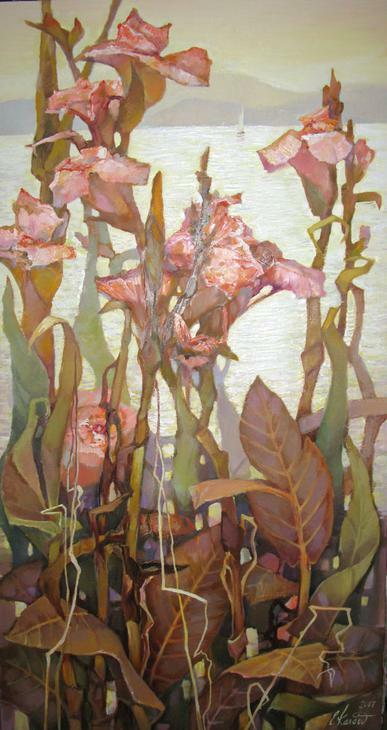 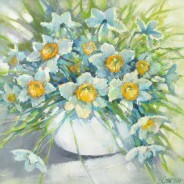 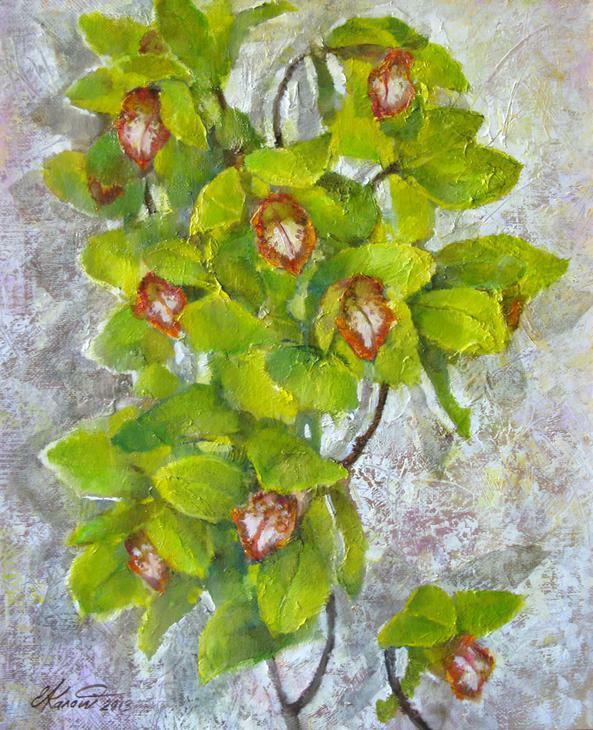 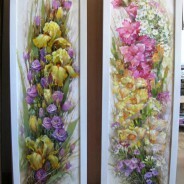 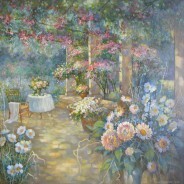 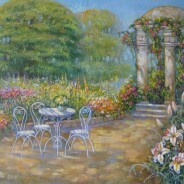 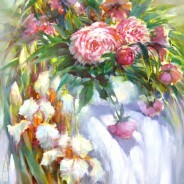 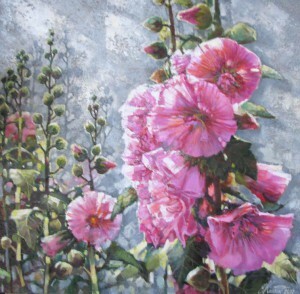 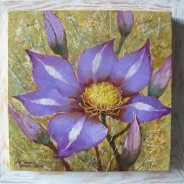 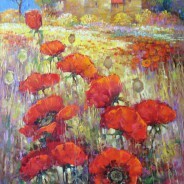 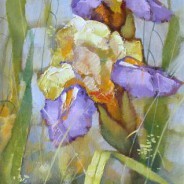 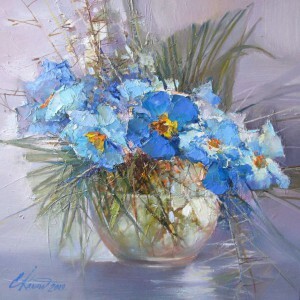 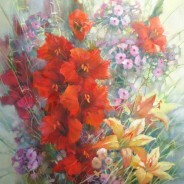 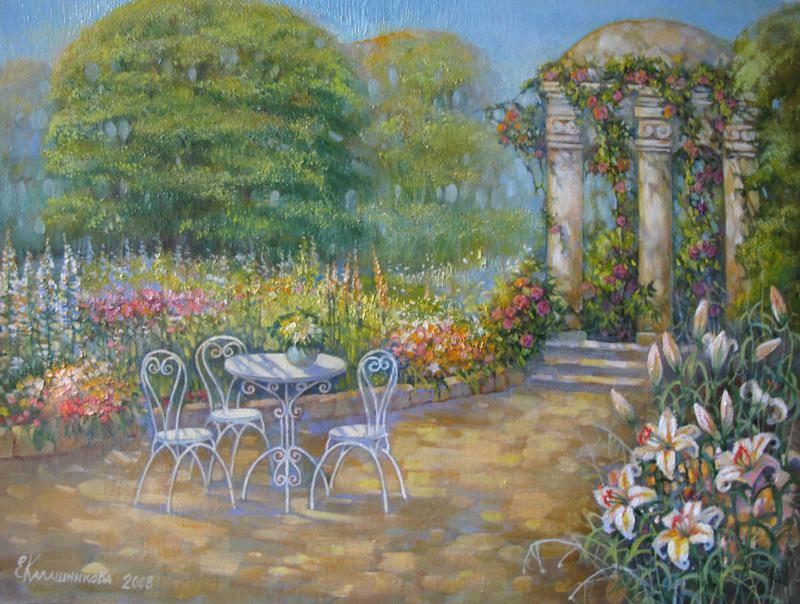 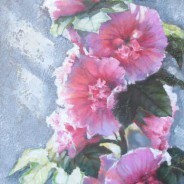 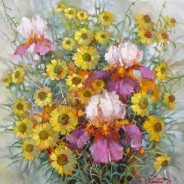 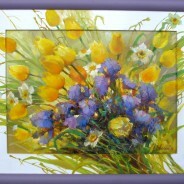 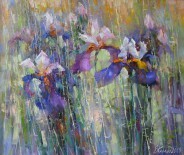 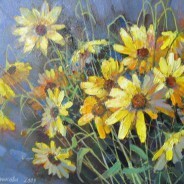 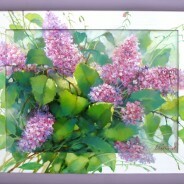 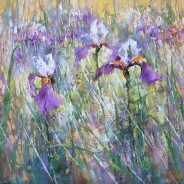 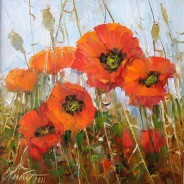 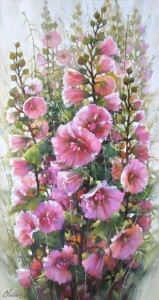 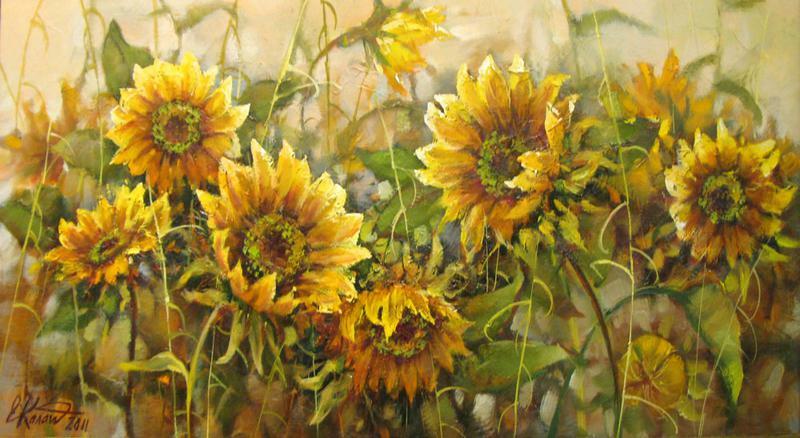 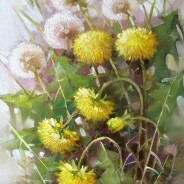 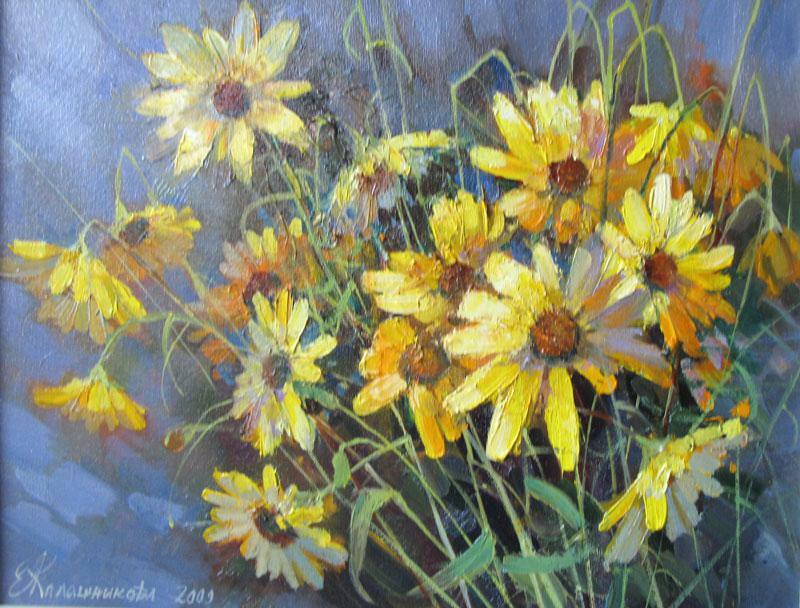 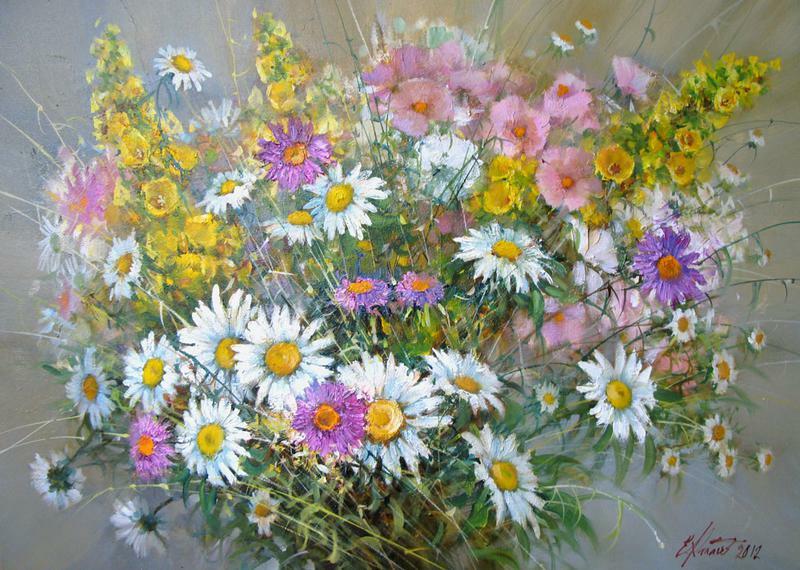 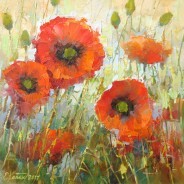 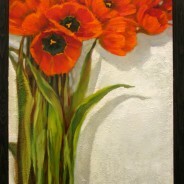 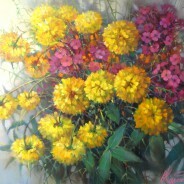 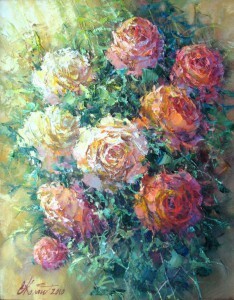 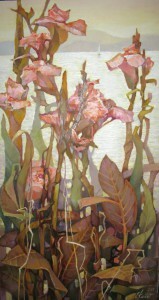 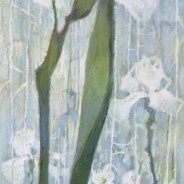 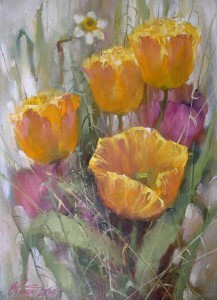 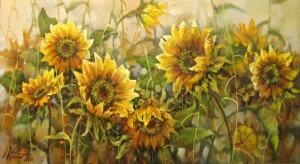 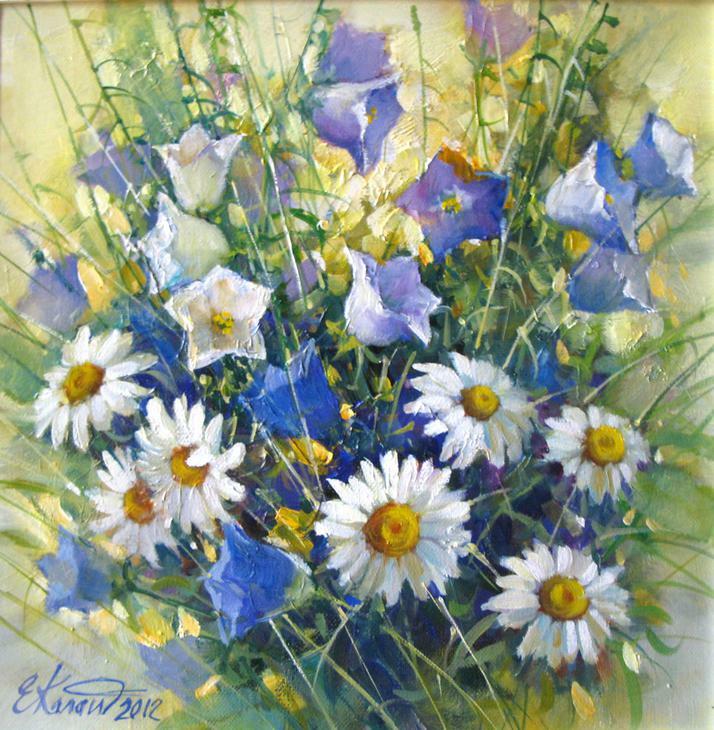 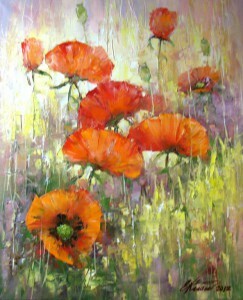 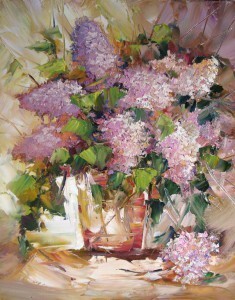 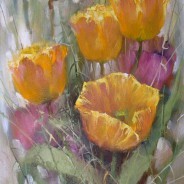 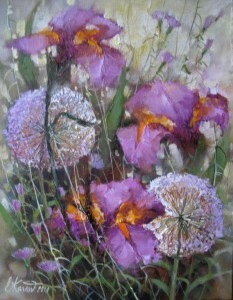 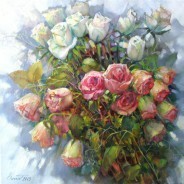 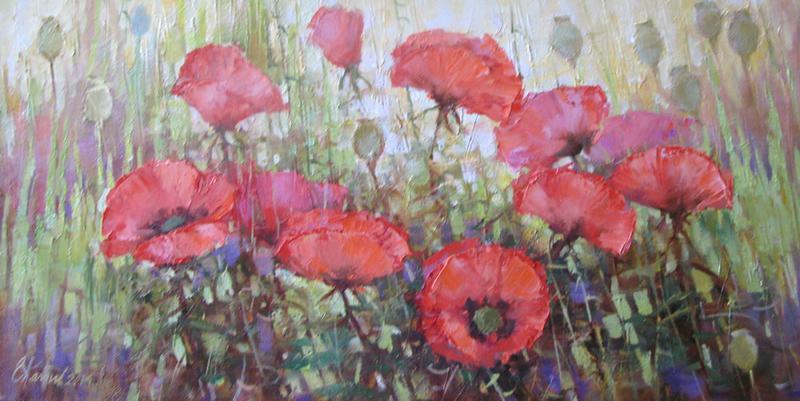 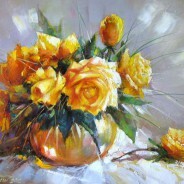 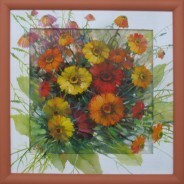 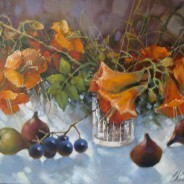 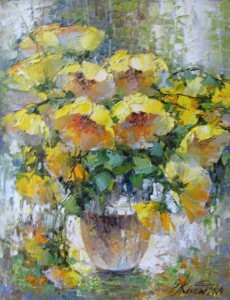 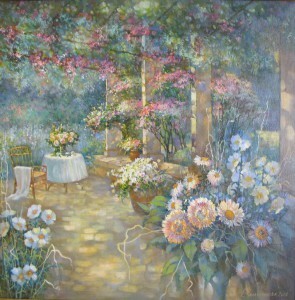 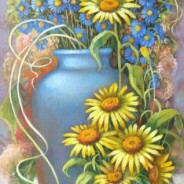 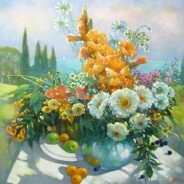 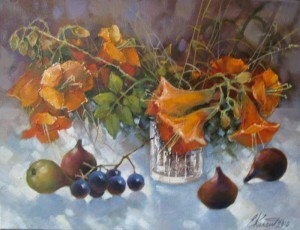 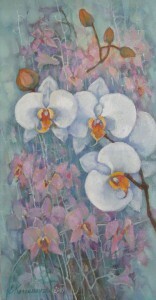 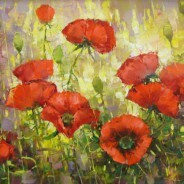 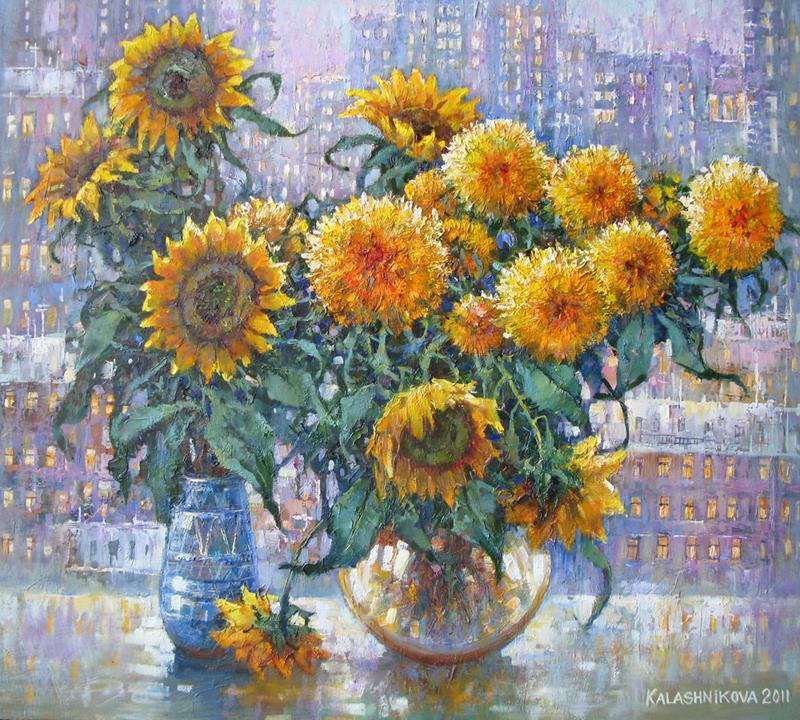 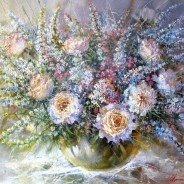 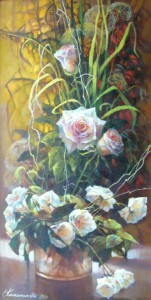 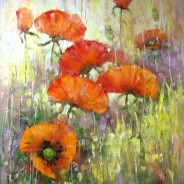 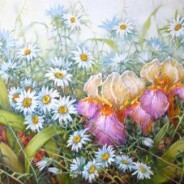 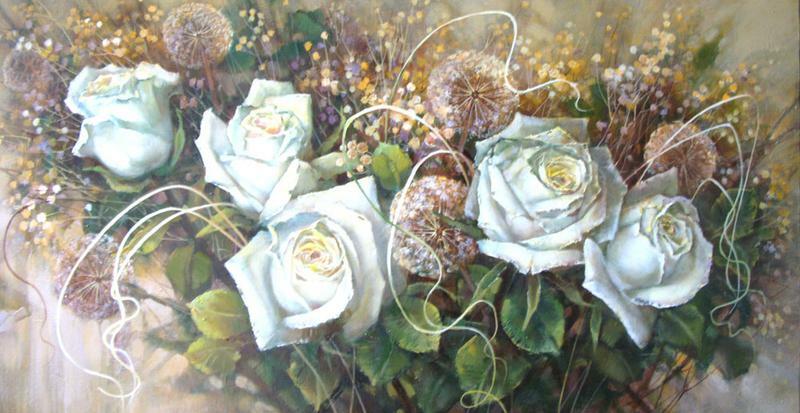 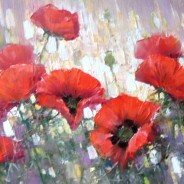 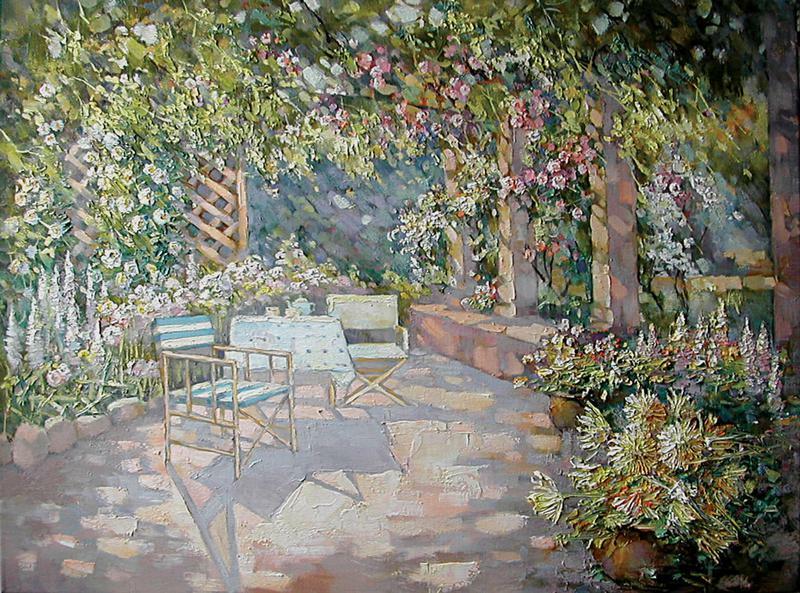 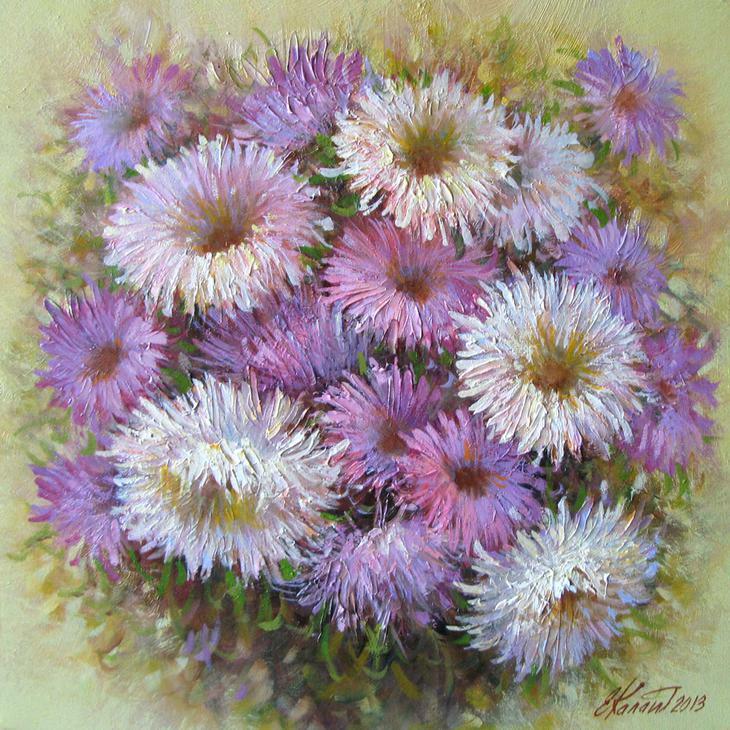 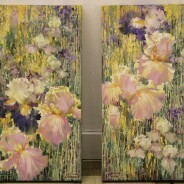 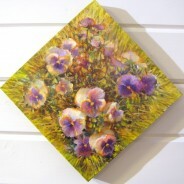 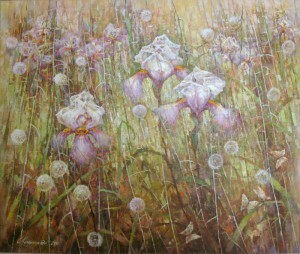 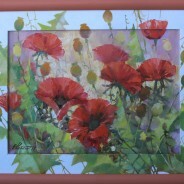 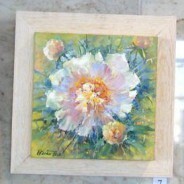 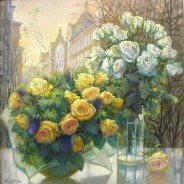 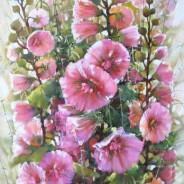 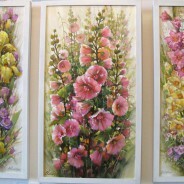 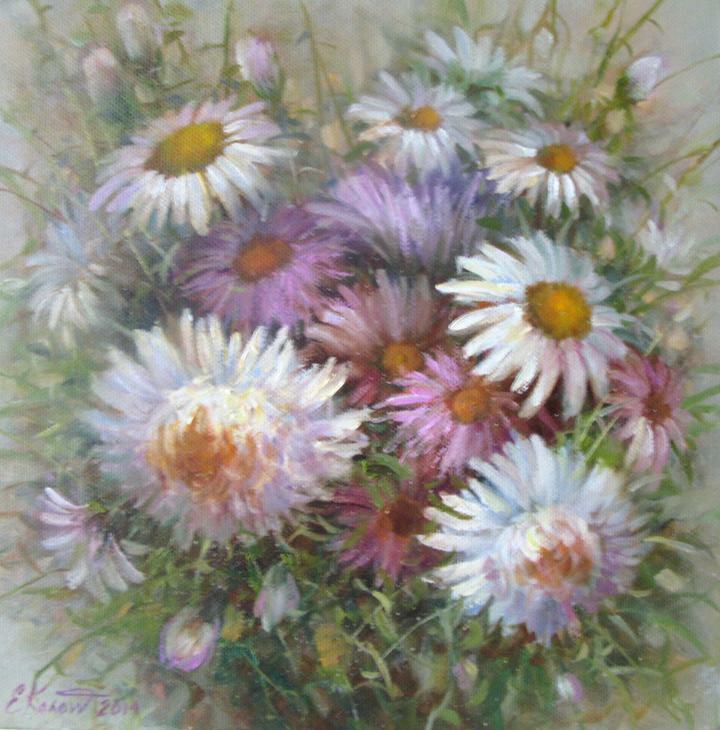 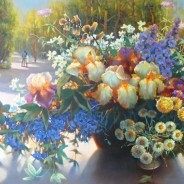 Depending on the task and the subject of the image appears smooth or bulk brushwork paintings of flowers oil. Great importance attaches to the artist plastic expression stroke at which the construction forms using color. 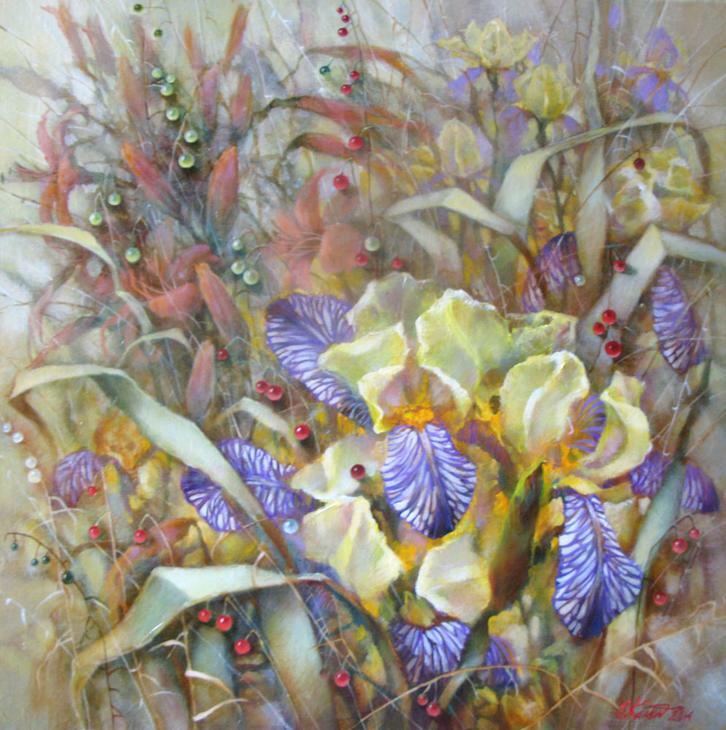 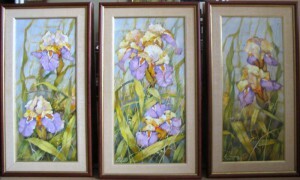 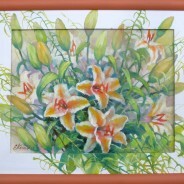 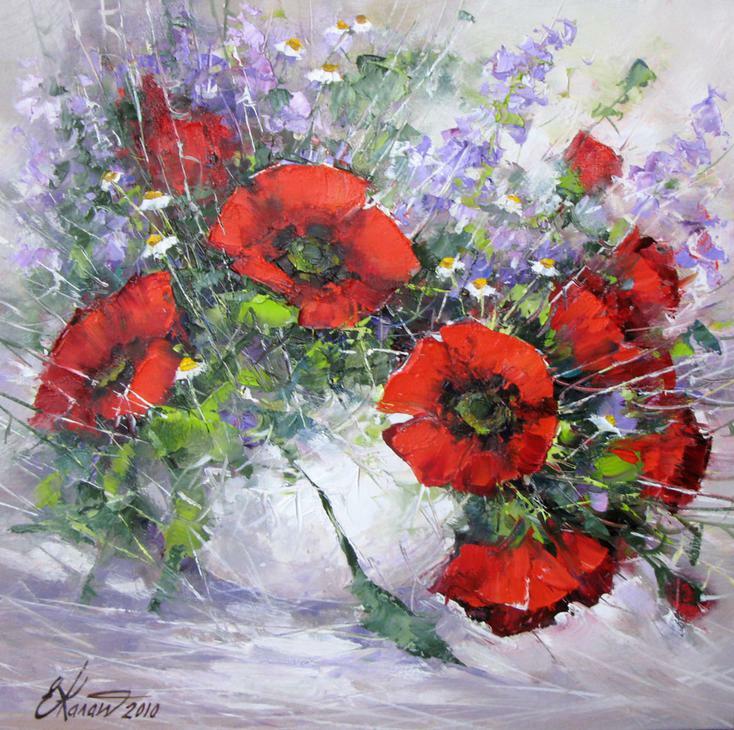 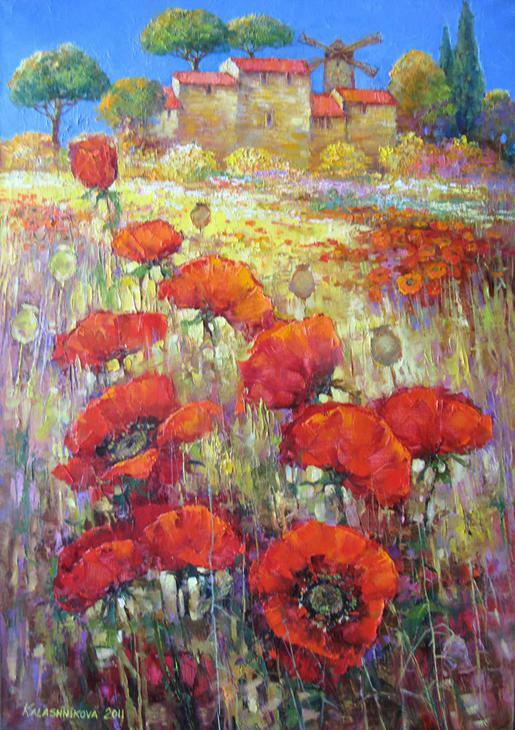 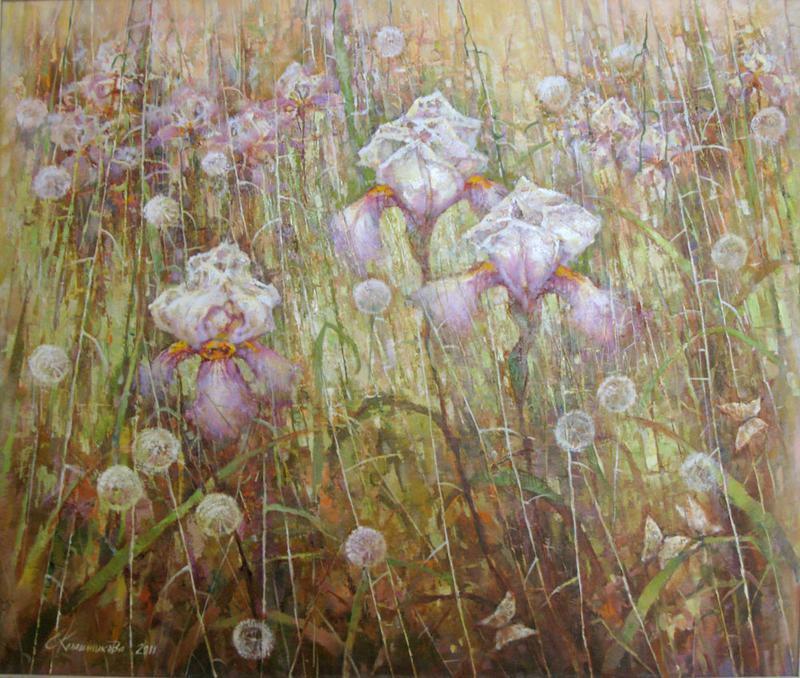 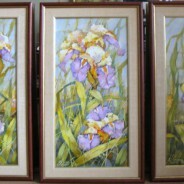 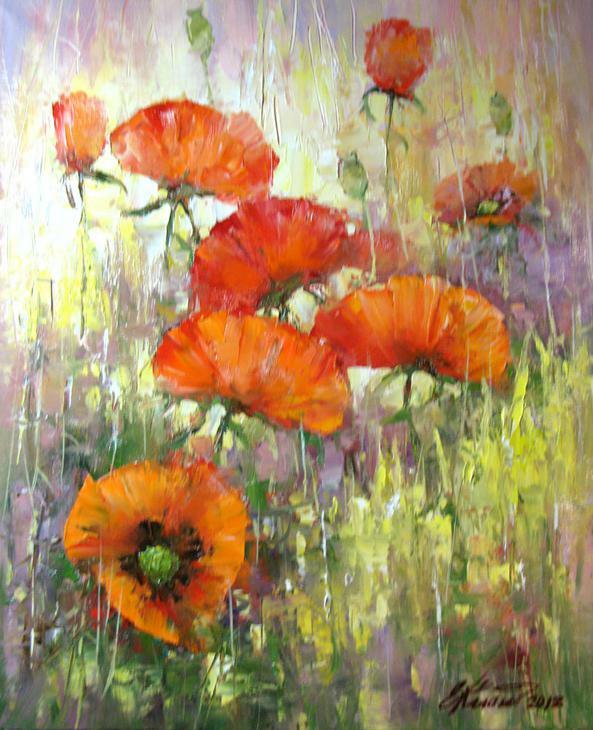 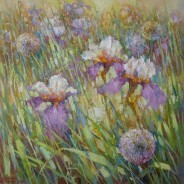 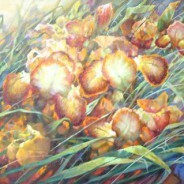 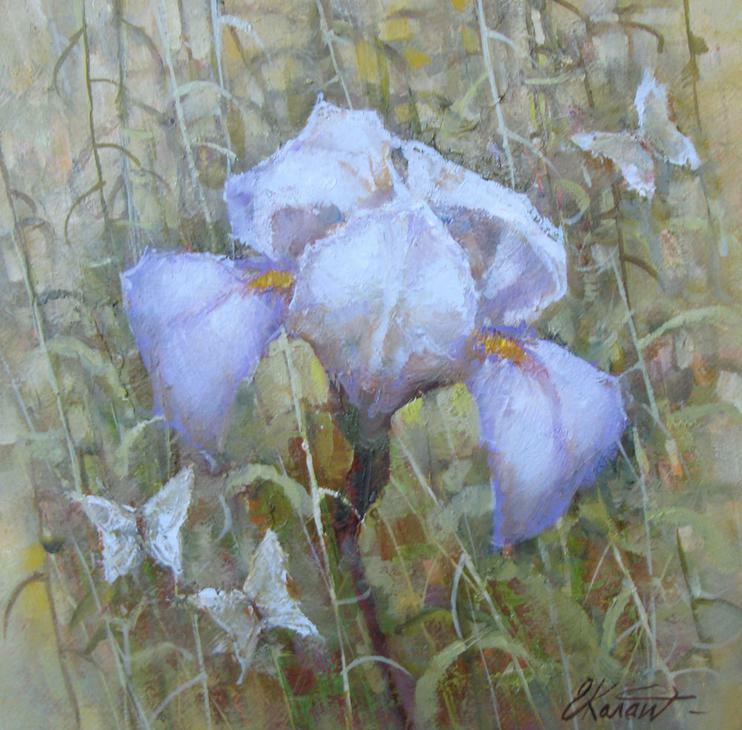 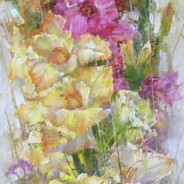 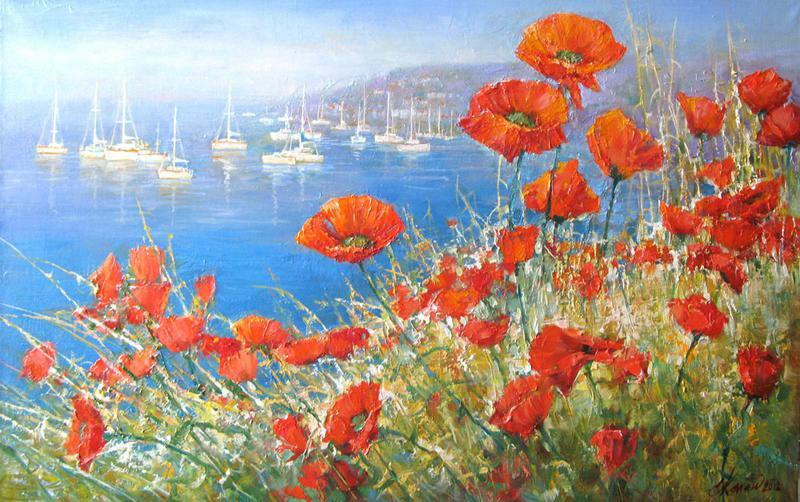 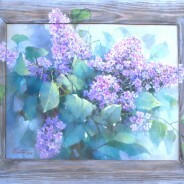 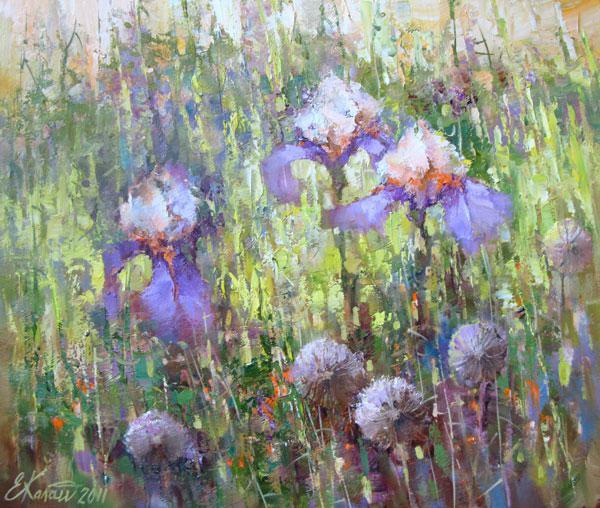 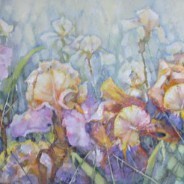 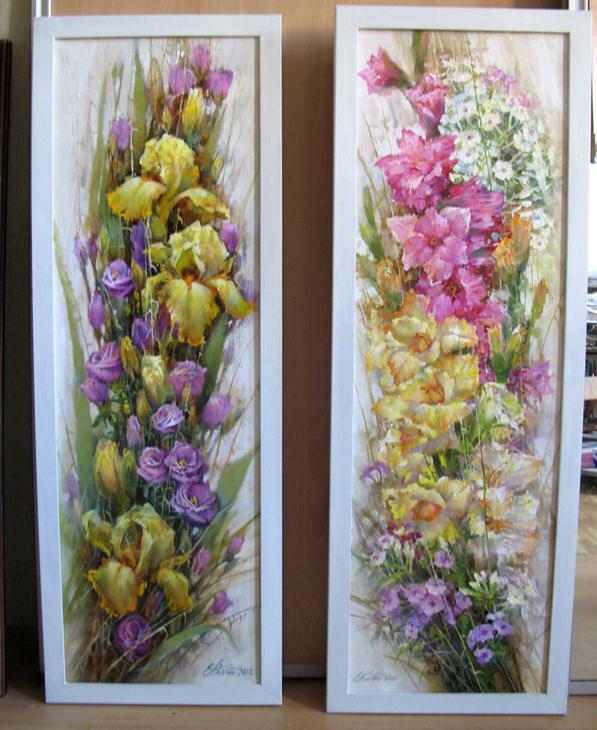 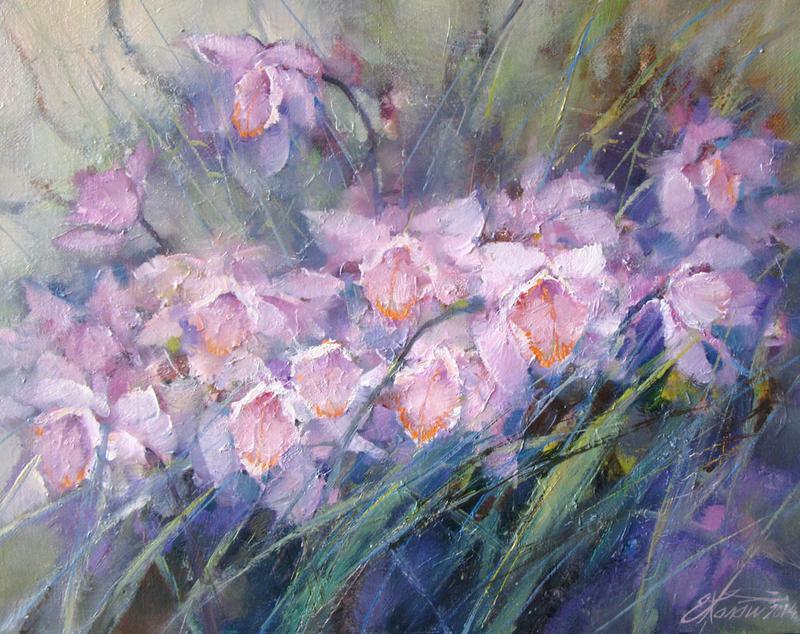 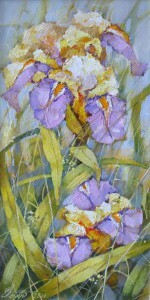 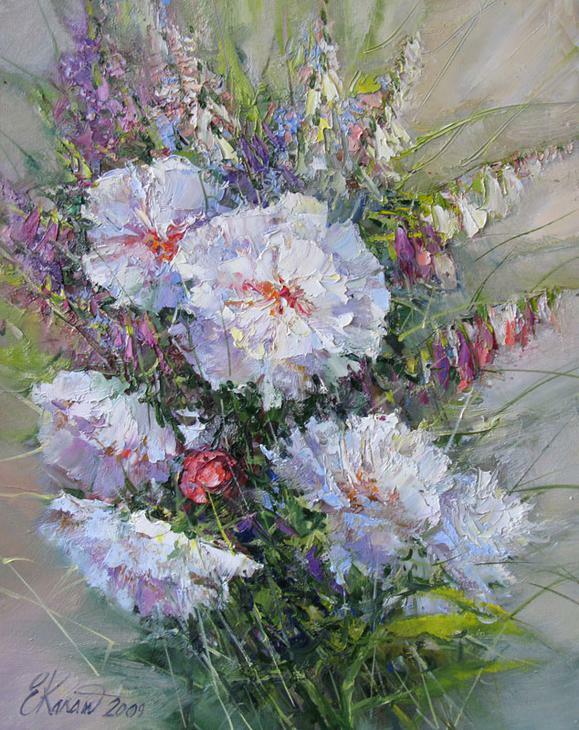 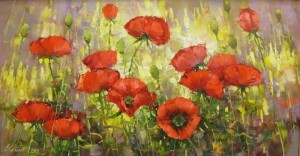 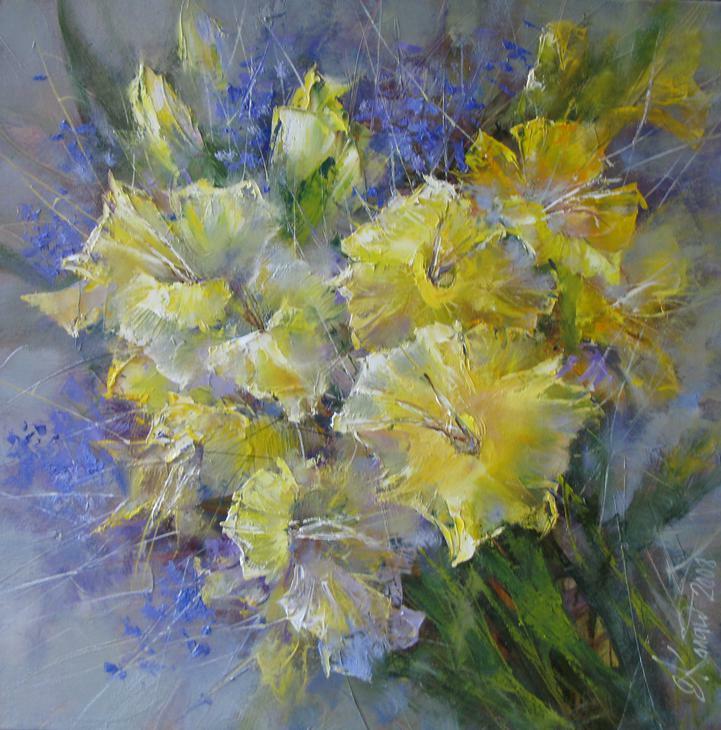 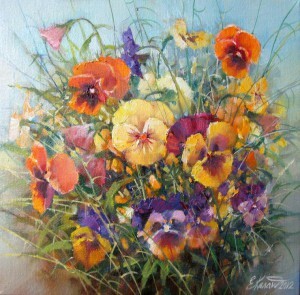 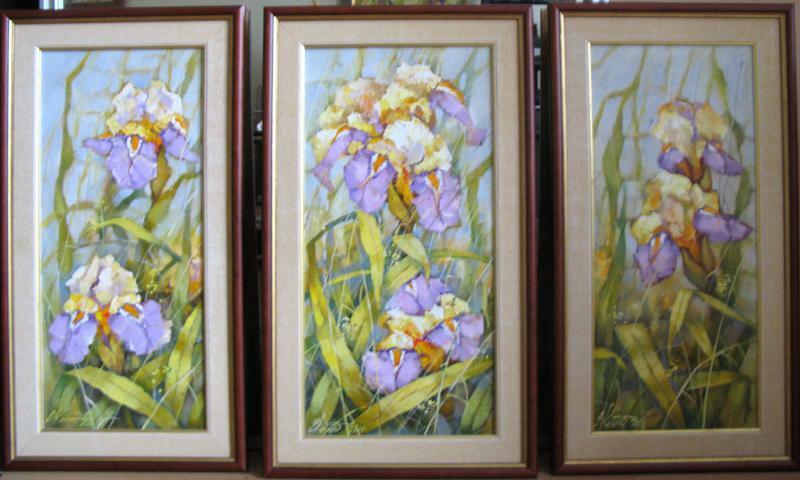 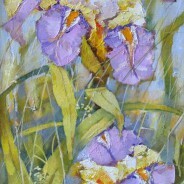 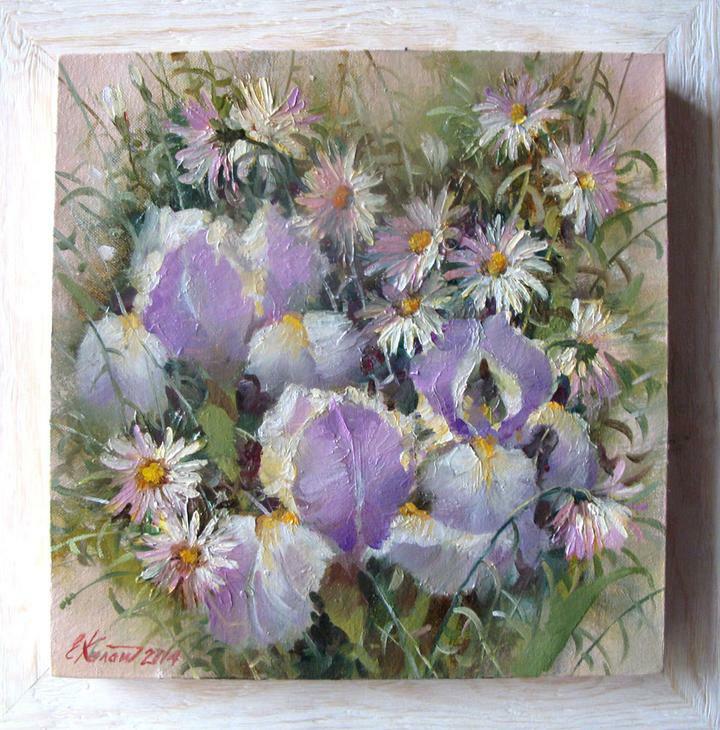 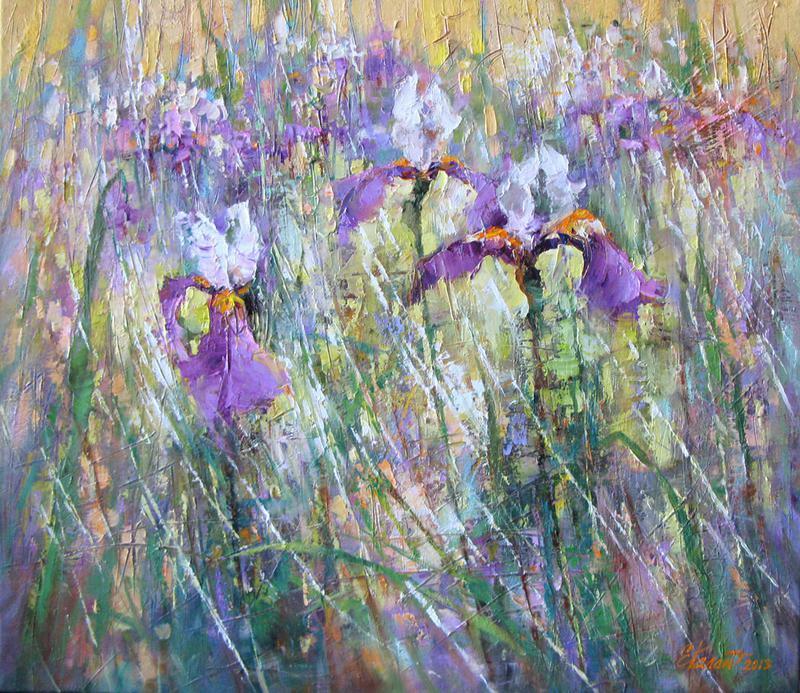 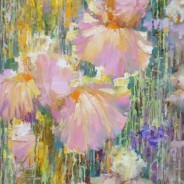 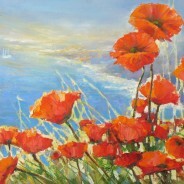 Thick brush strokes of bright colors to convey the feeling of a mature spirituality pions and gladioli, lilies and ponderous fragrance almost watercolor breathes life into the fragile wildflowers – poppies, violets, lilies of the valley. 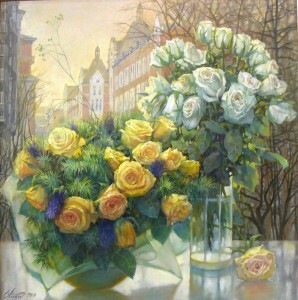 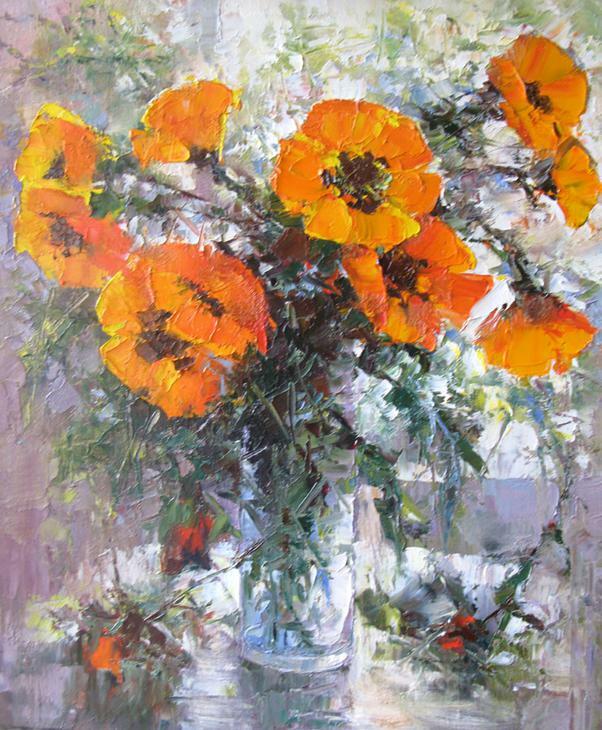 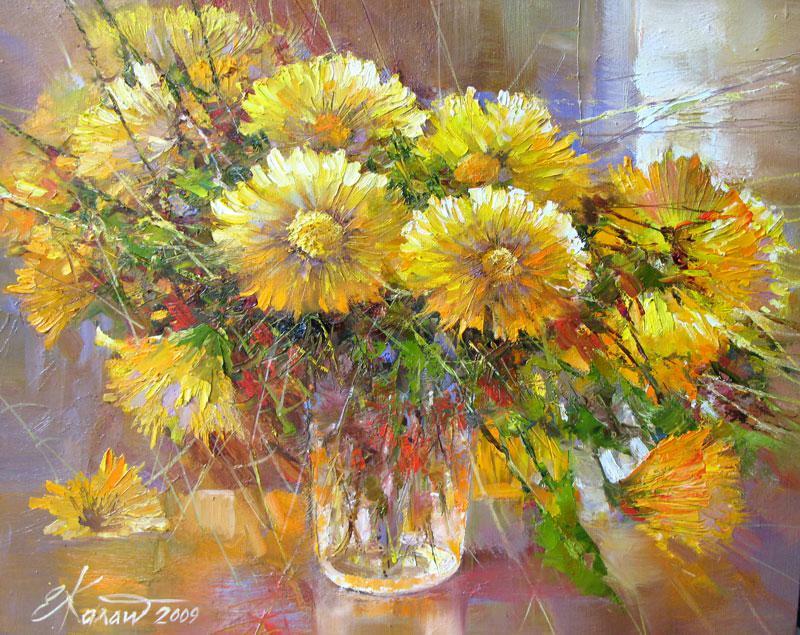 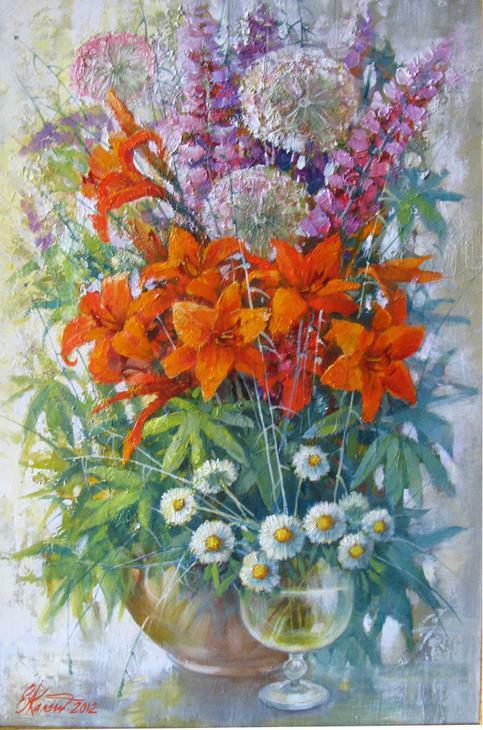 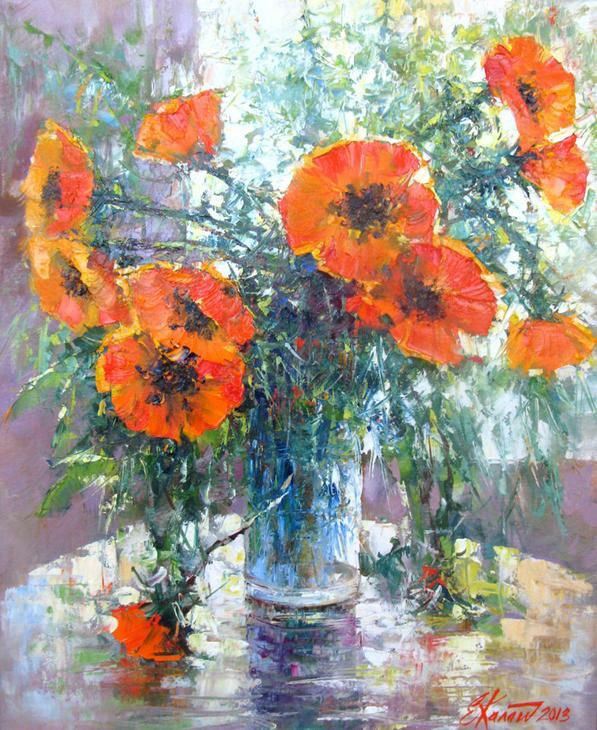 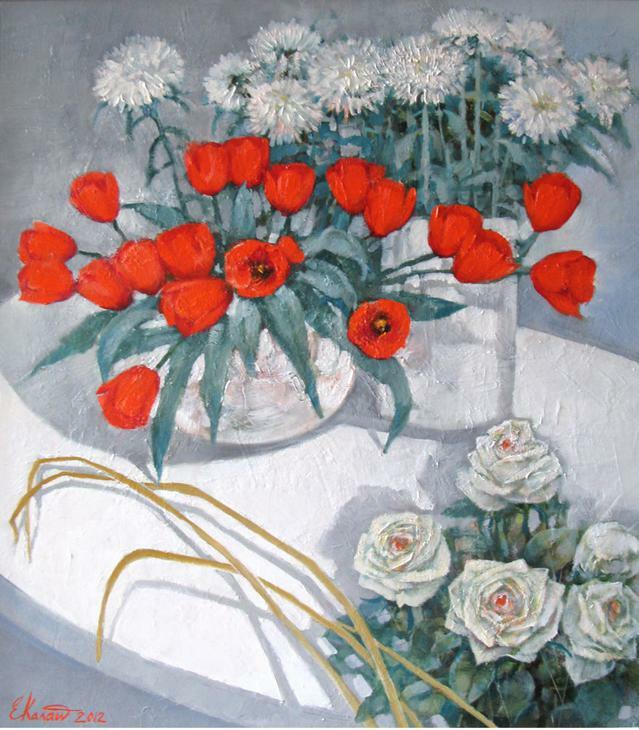 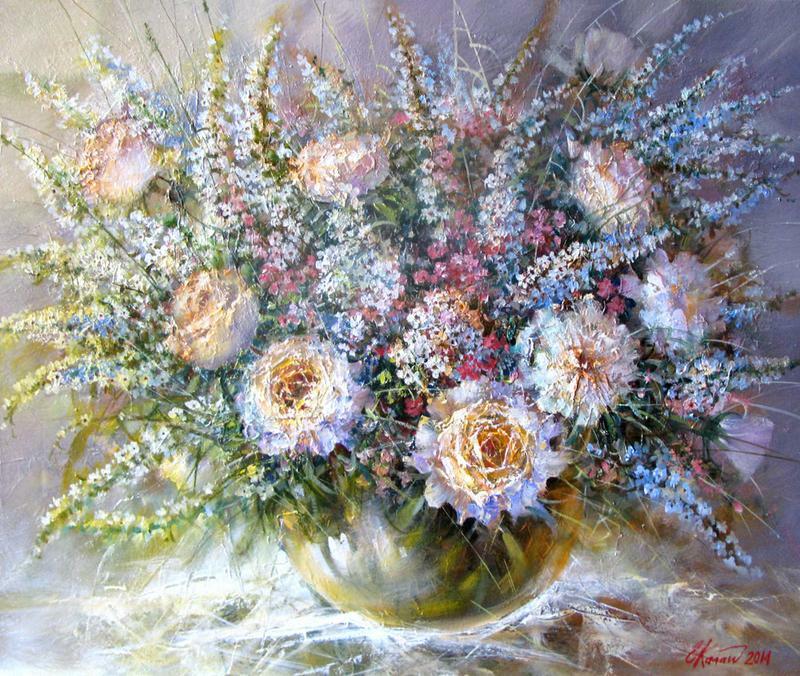 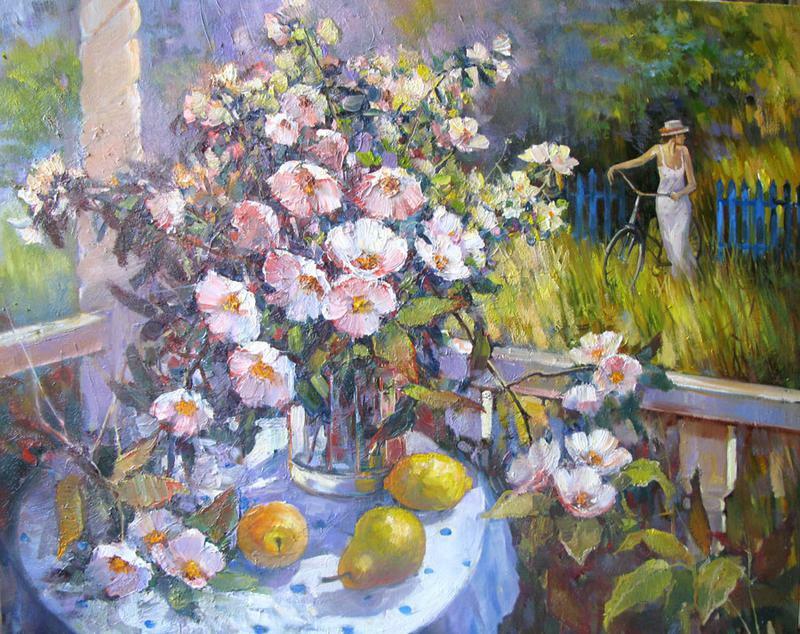 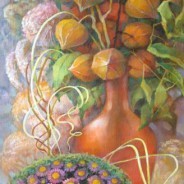 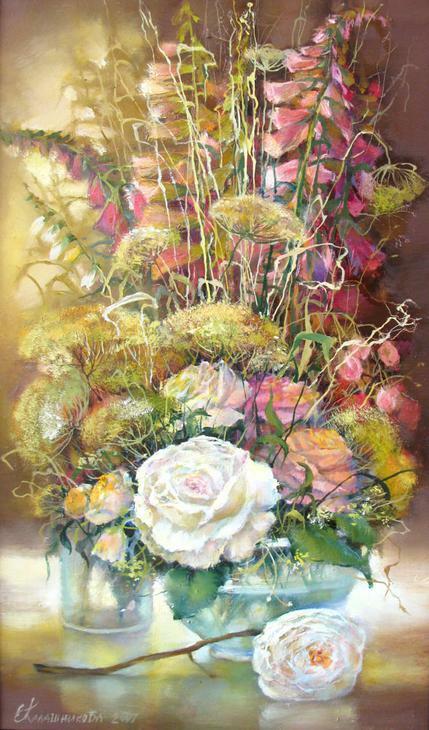 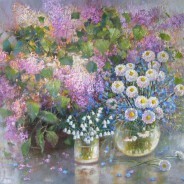 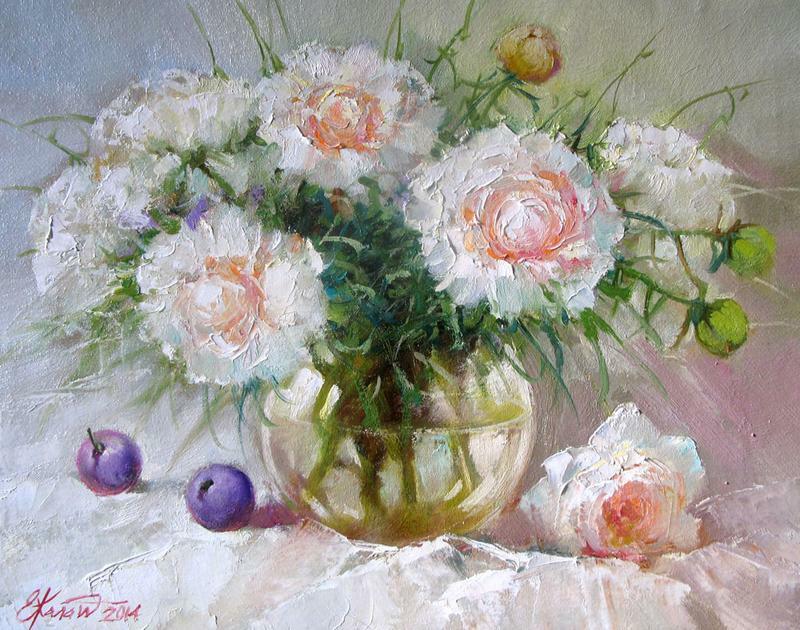 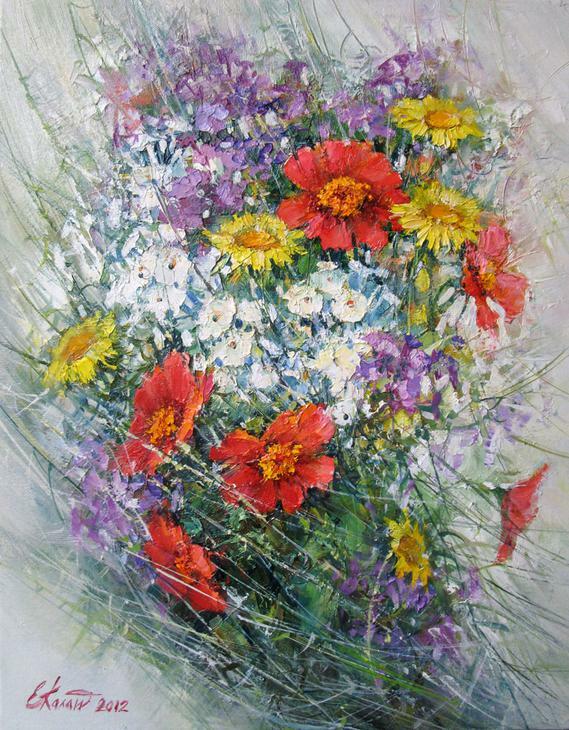 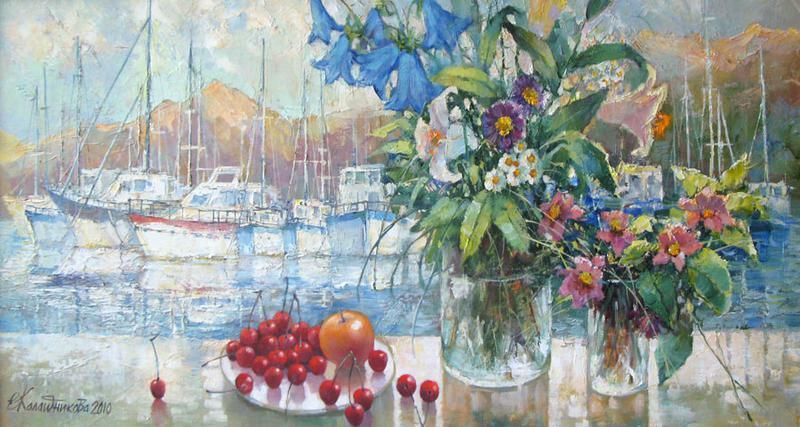 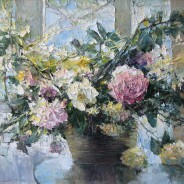 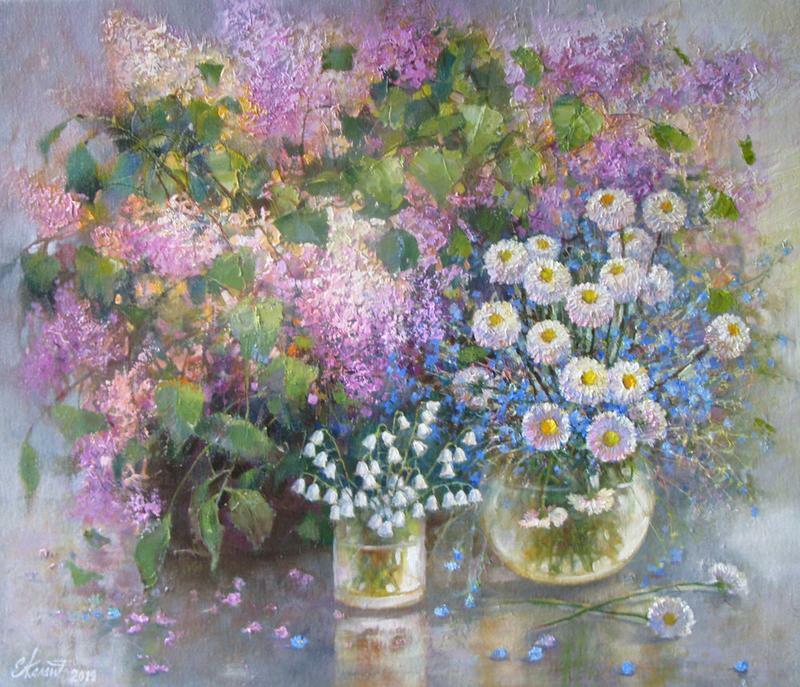 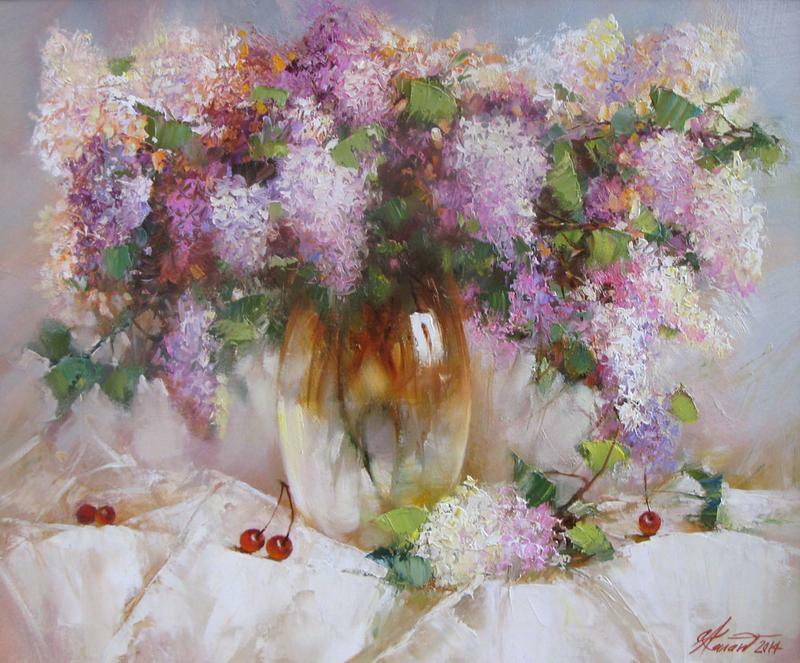 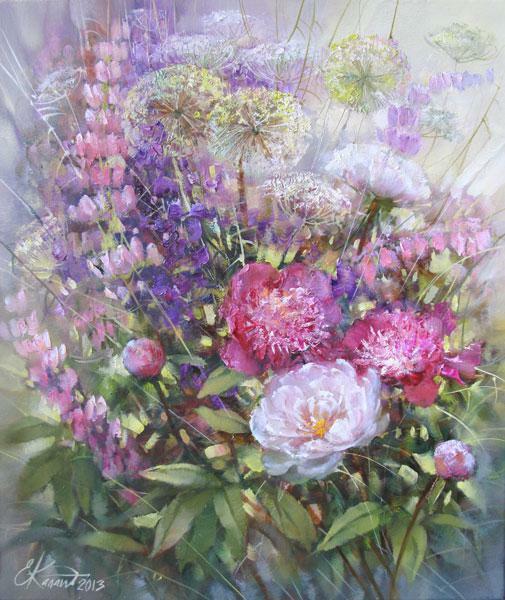 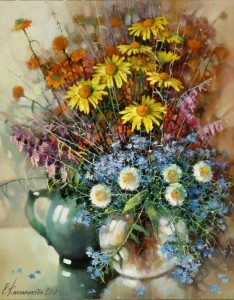 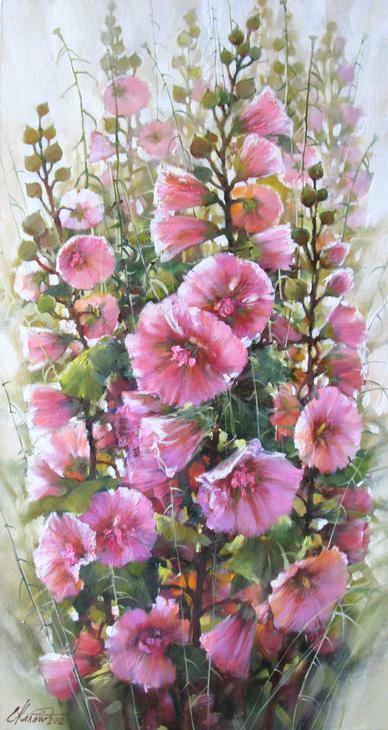 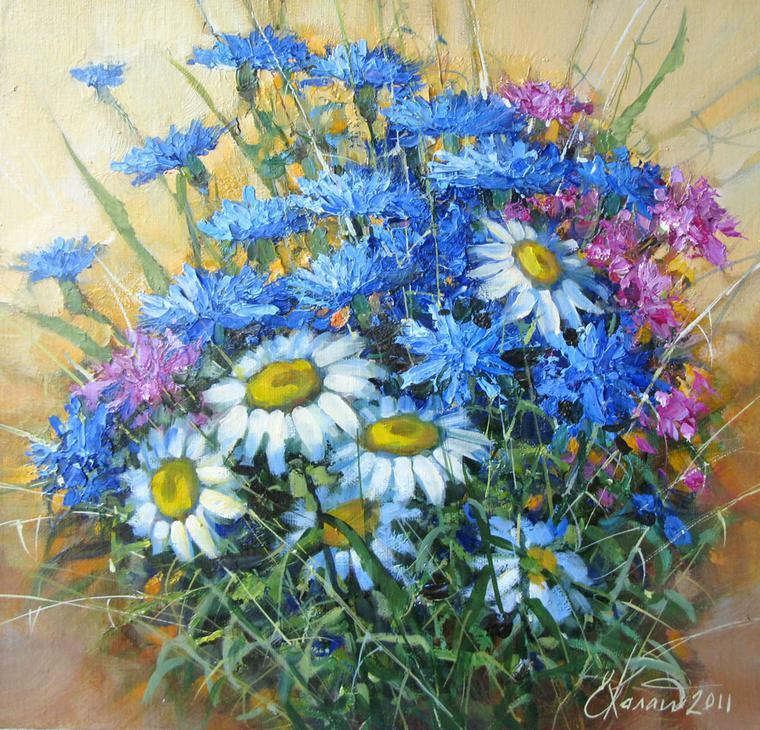 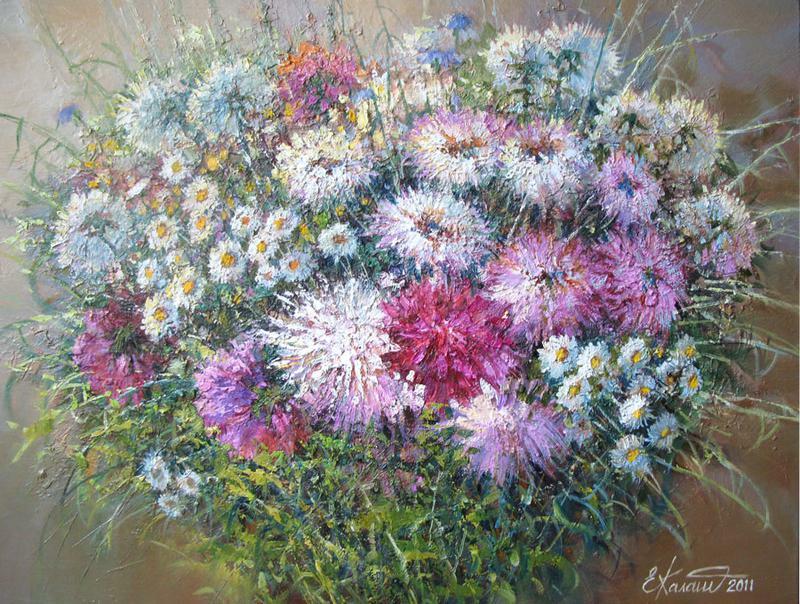 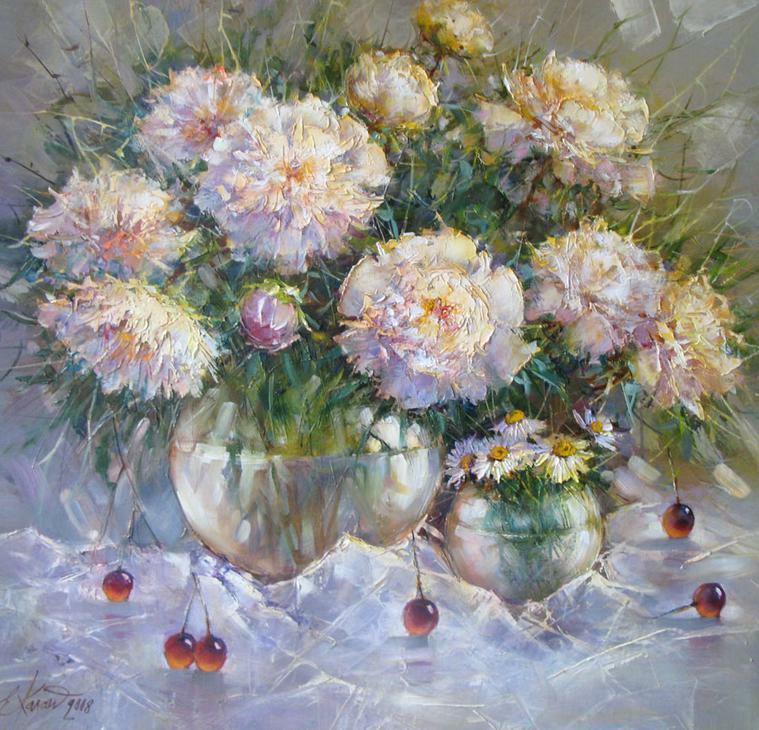 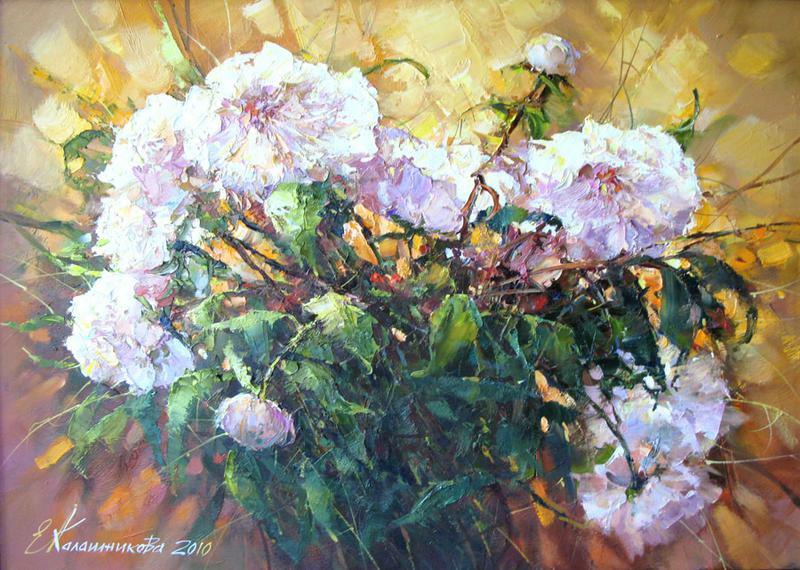 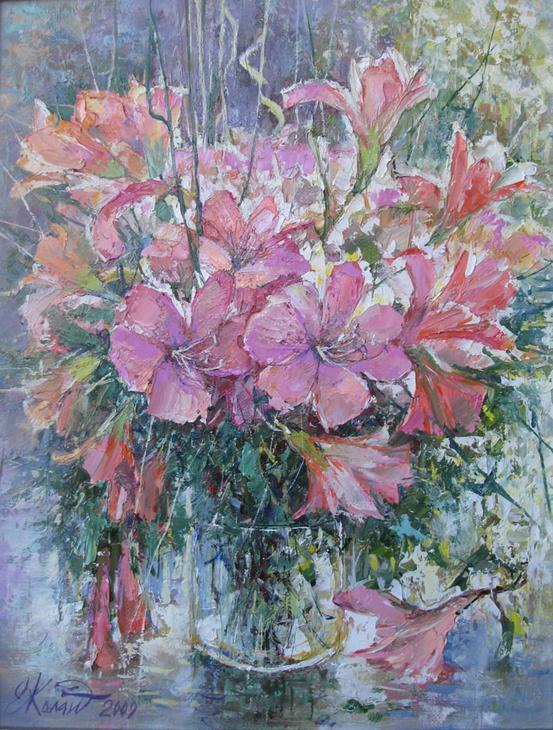 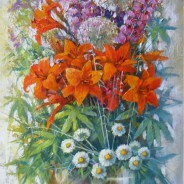 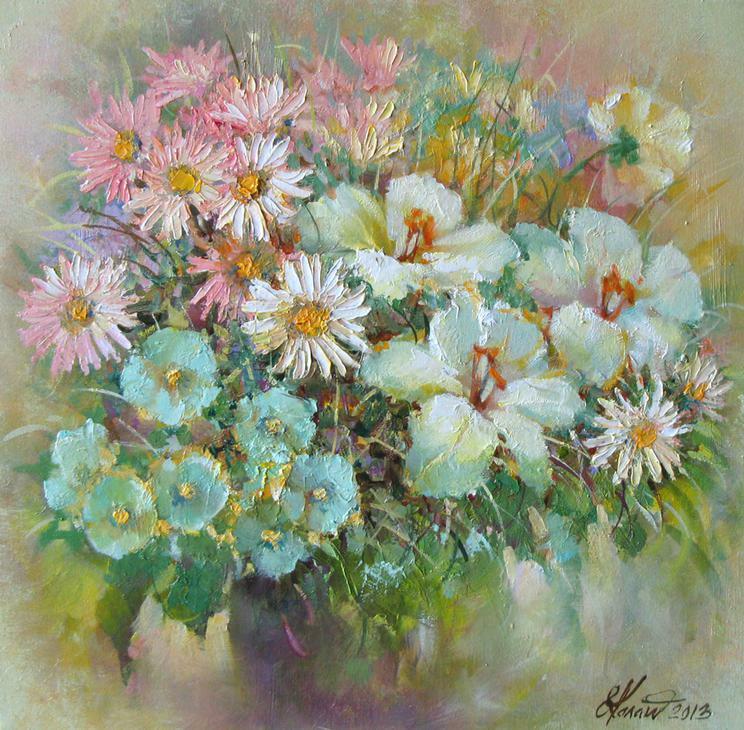 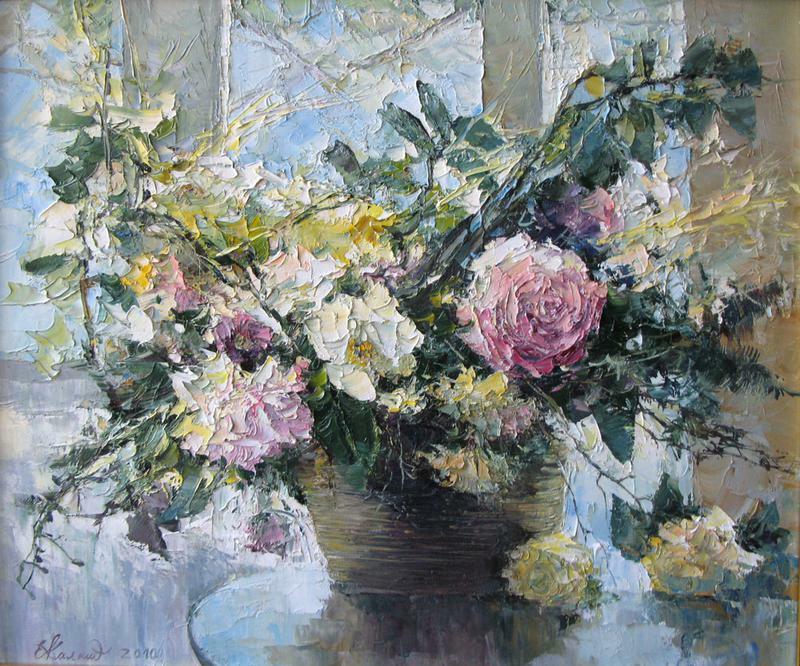 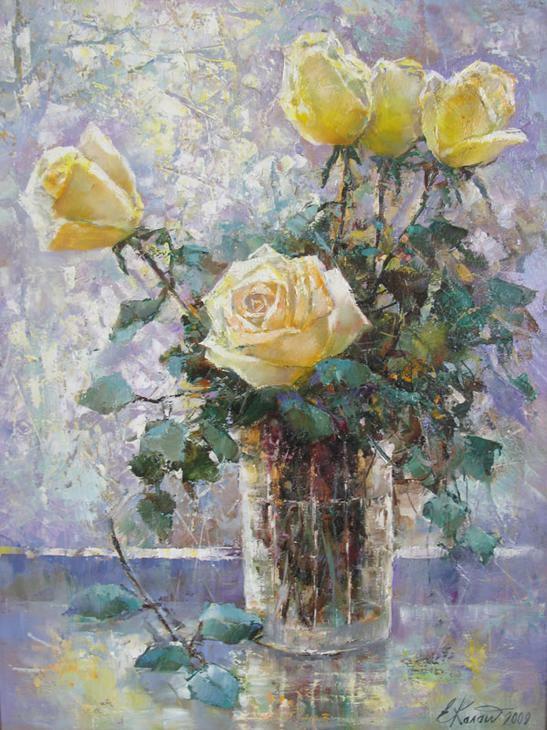 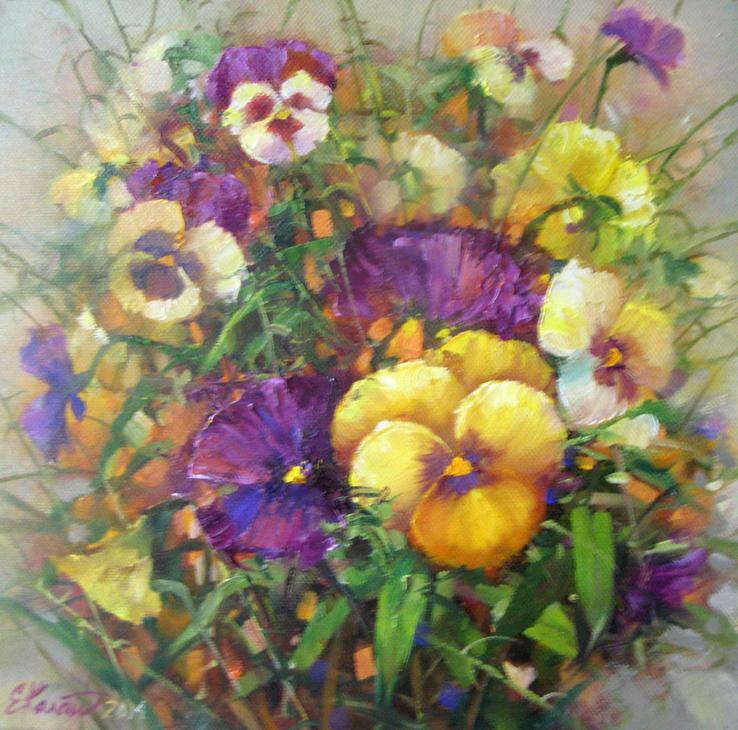 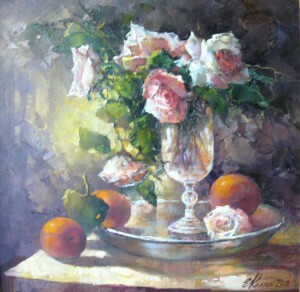 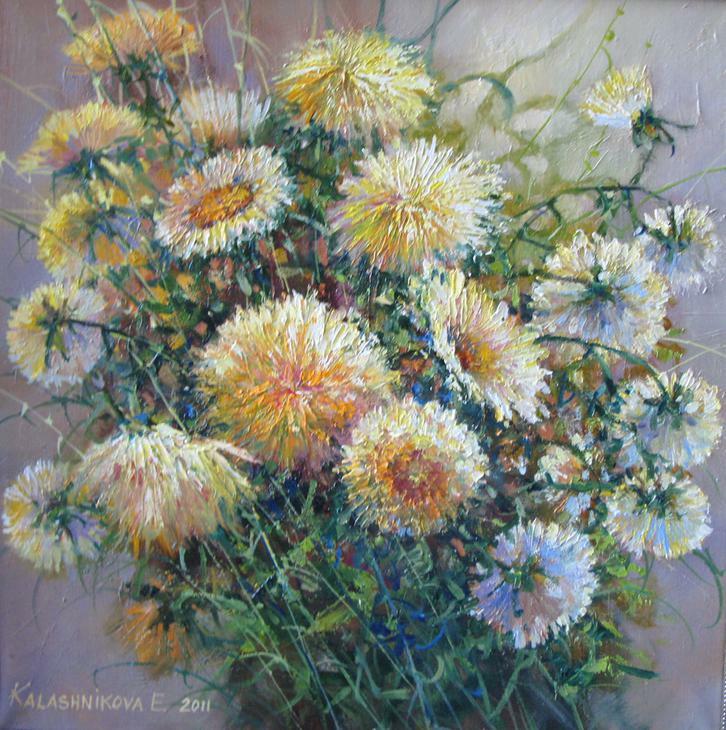 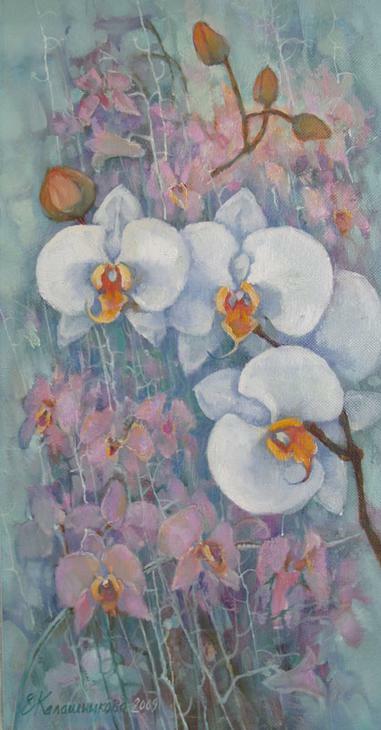 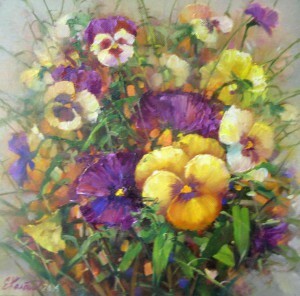 Still Life with Flowers – is a delight in the beauty of the artist, the richness of forms and color variety splendor of the natural world that surrounds man. 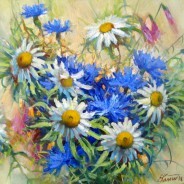 Золотые шары х.м. 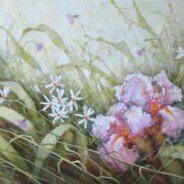 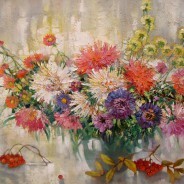 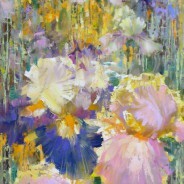 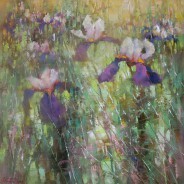 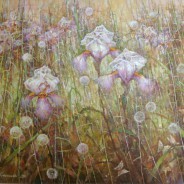 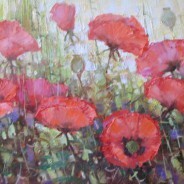 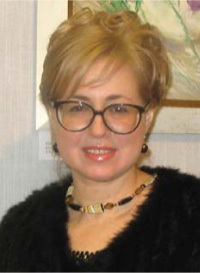 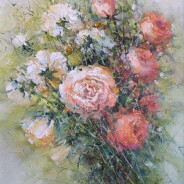 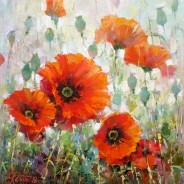 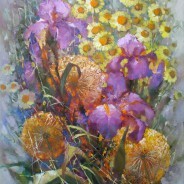 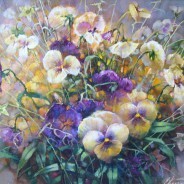 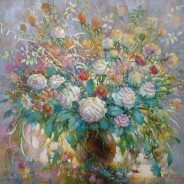 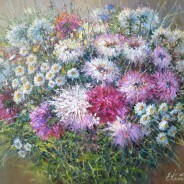 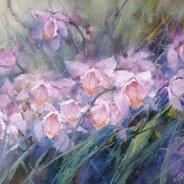 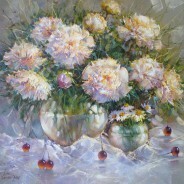 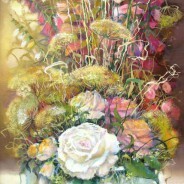 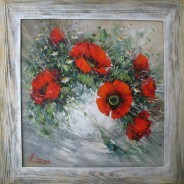 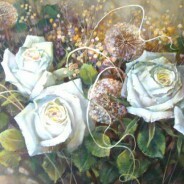 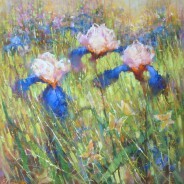 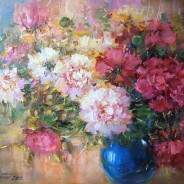 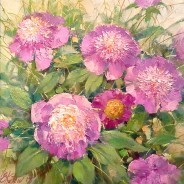 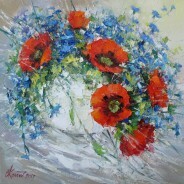 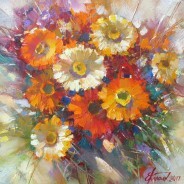 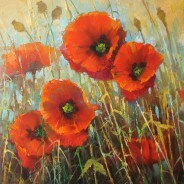 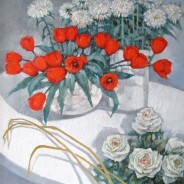 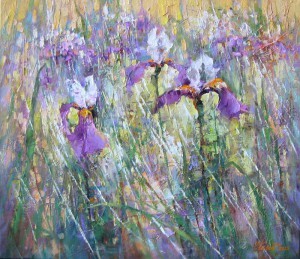 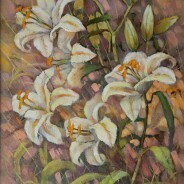 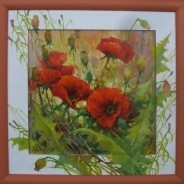 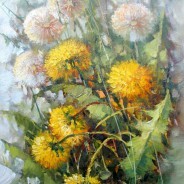 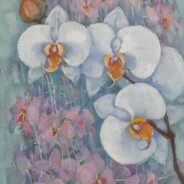 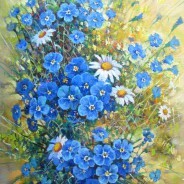 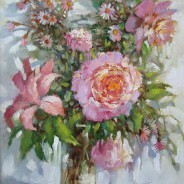 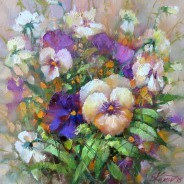 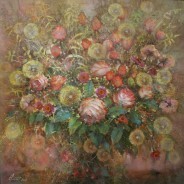 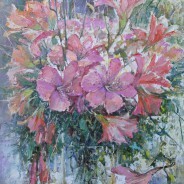 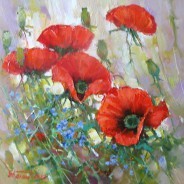 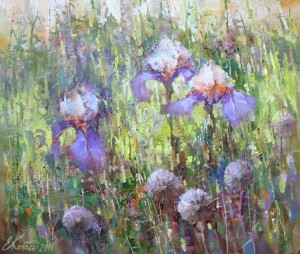 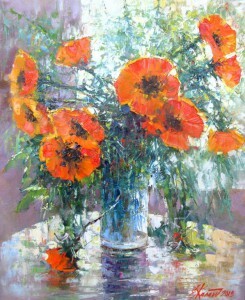 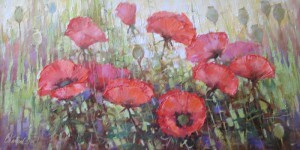 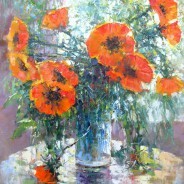 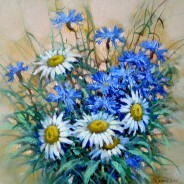 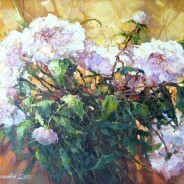 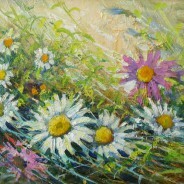 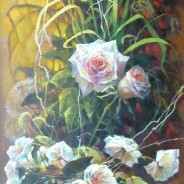 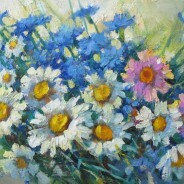 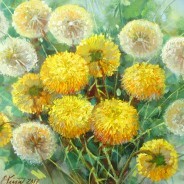 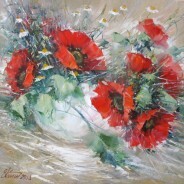 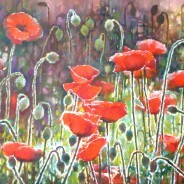 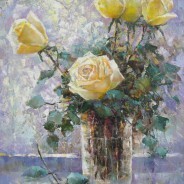 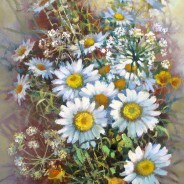 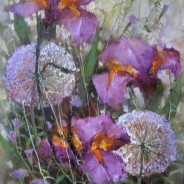 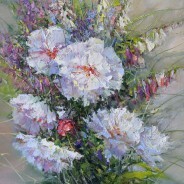 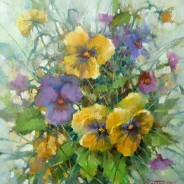 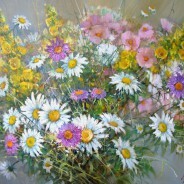 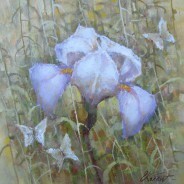 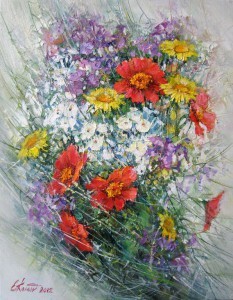 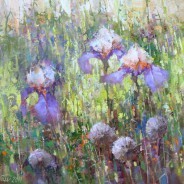 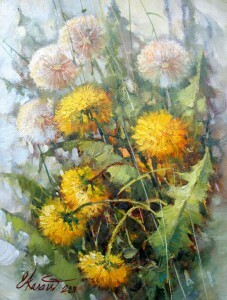 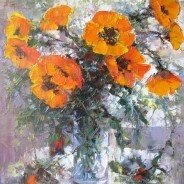 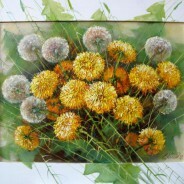 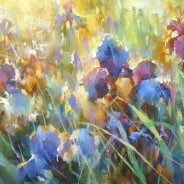 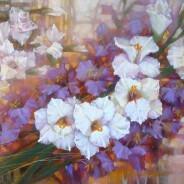 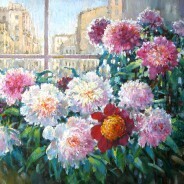 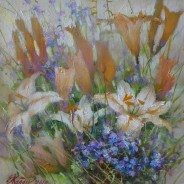 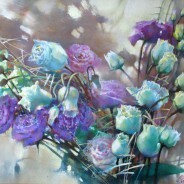 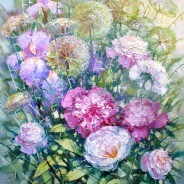 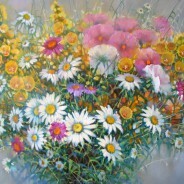 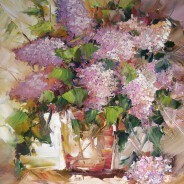 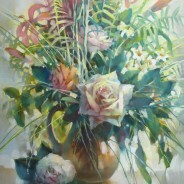 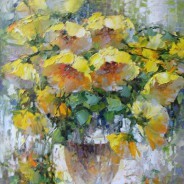 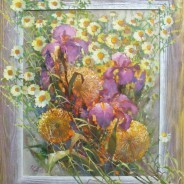 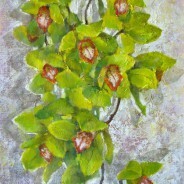 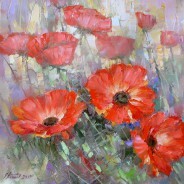 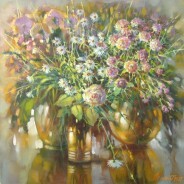 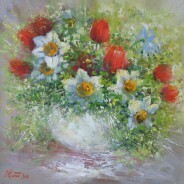 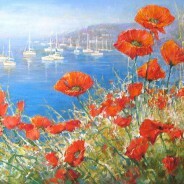 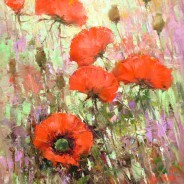 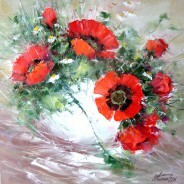 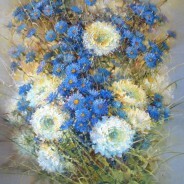 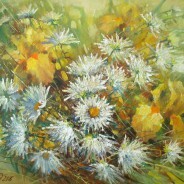 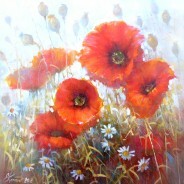 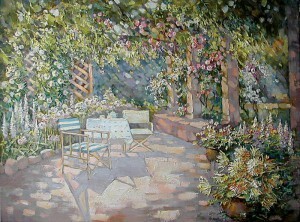 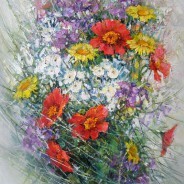 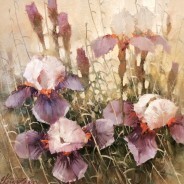 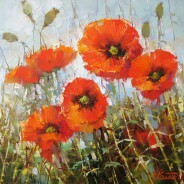 40х50 2016г. Букет с васильками и маками х.м. 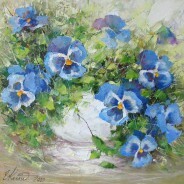 50х50 2017г. Букет с ромашками и бабочкой х.м. 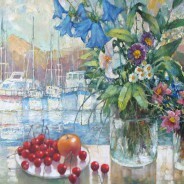 20х30 2018г. Утренние пионы х.м. 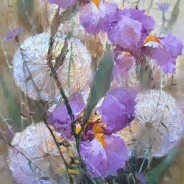 50х60 2018г. Желтые тюльпаны х.м. 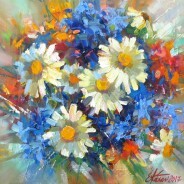 50х130 2018г. 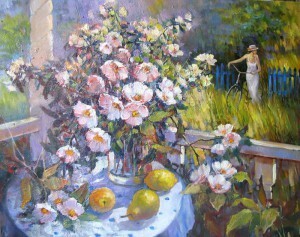 ОЖИДАНИЕ ПРАЗДНИКА Х.М. 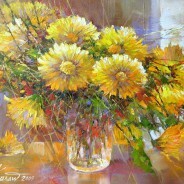 90Х90 2018Г. Букет с васильками. 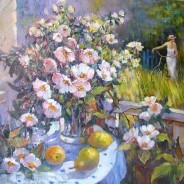 х.м. 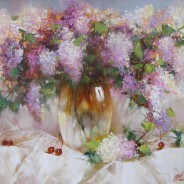 30х30 2018г. 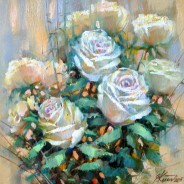 Цветочная кадриль х.м. 50х60 2018г. 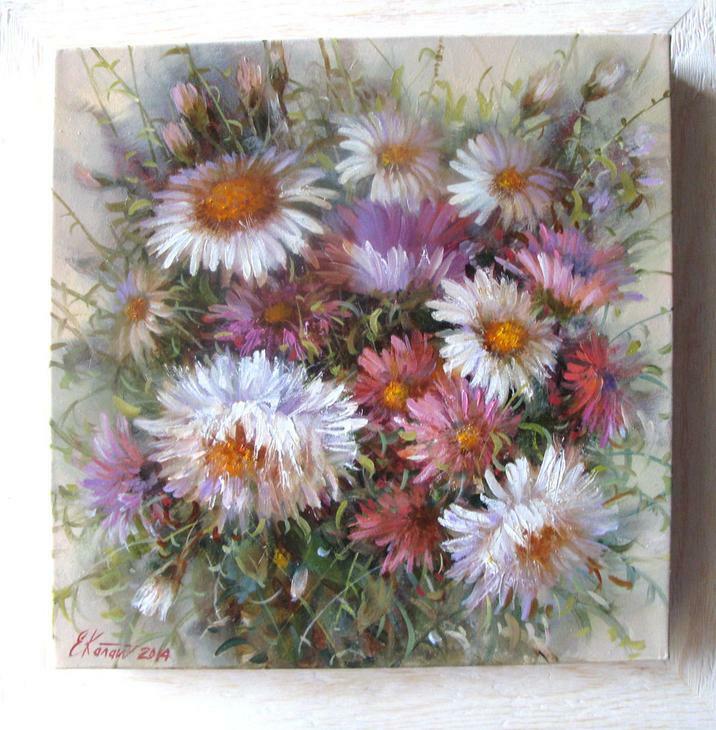 Ноктюрн с маками. 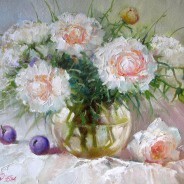 х.м. 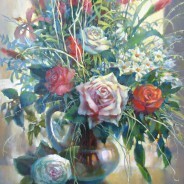 30х40 в авторской раме 2019г.